Zortec Utility Billing Beginner Session Note – this session is intended for new or beginner level users of the Z Utility Billing System. 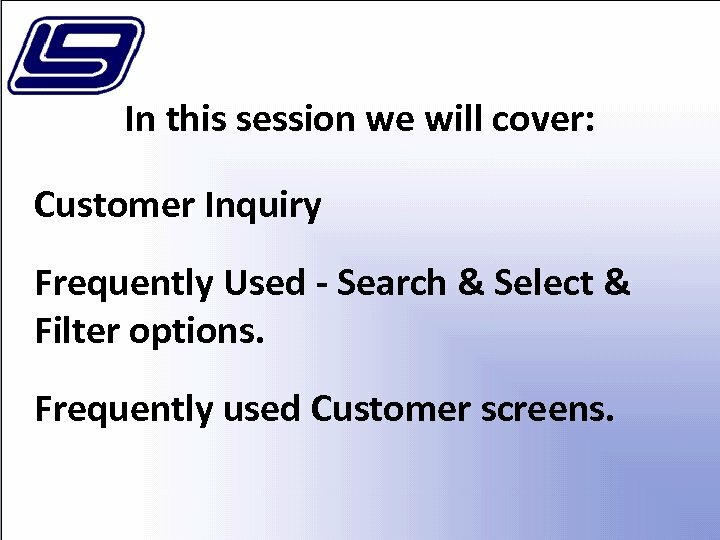 In this session we will cover: Customer Inquiry Frequently Used - Search & Select & Filter options. Frequently used Customer screens. 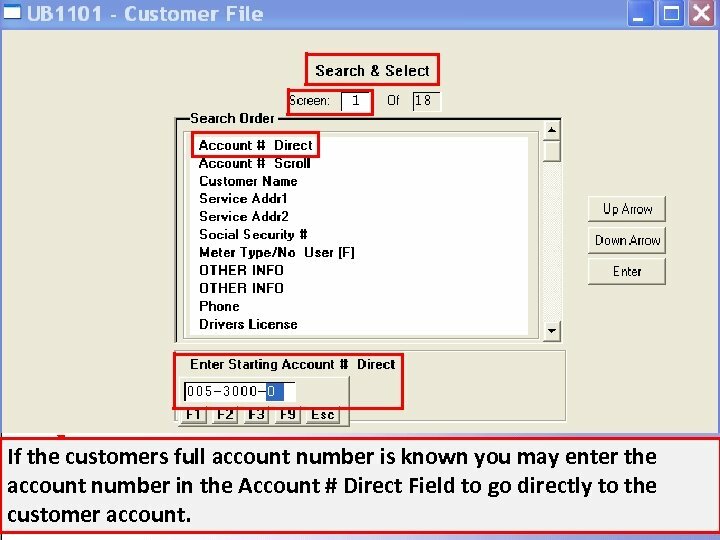 If the customers full account number is known you may enter the account number in the Account # Direct Field to go directly to the customer account. 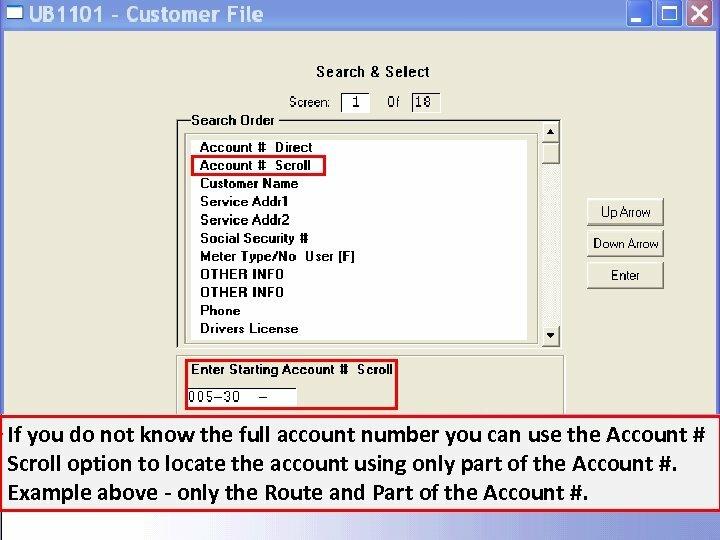 If you do not know the full account number you can use the Account # Scroll option to locate the account using only part of the Account #. 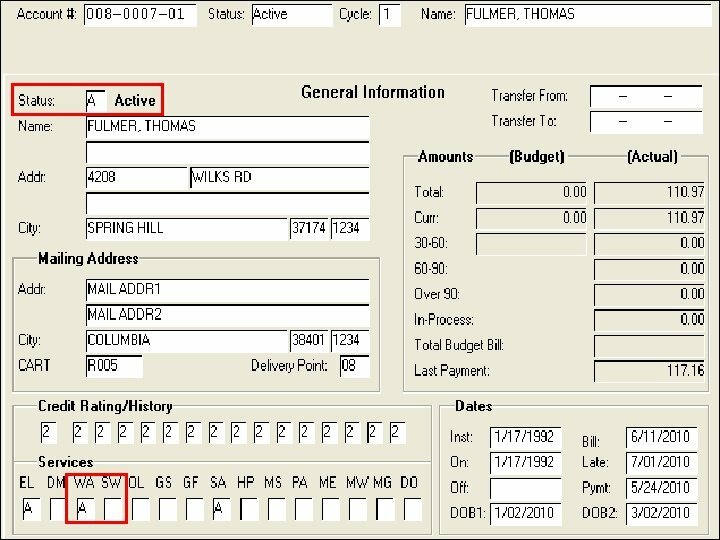 Example above - only the Route and Part of the Account #. 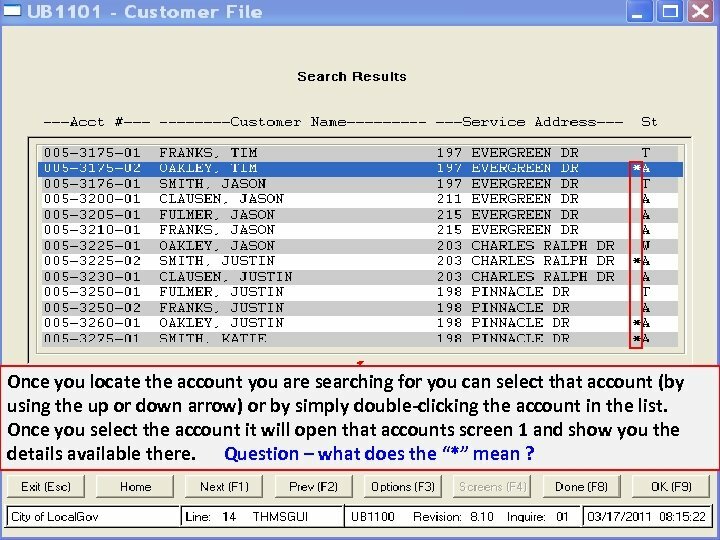 This will give you a list of accounts starting with the partial Account # data entered in the Search and Select screen. The list includes Account #, Customer Name, Service Address and Status. You can scroll forward or backwards from this starting point by using the Next (F 1) or Prev (F 2) options. Once you locate the account you are searching for you can select that account (by using the up or down arrow) or by simply double-clicking the account in the list. Once you select the account it will open that accounts screen 1 and show you the details available there. Question – what does the “*” mean ? 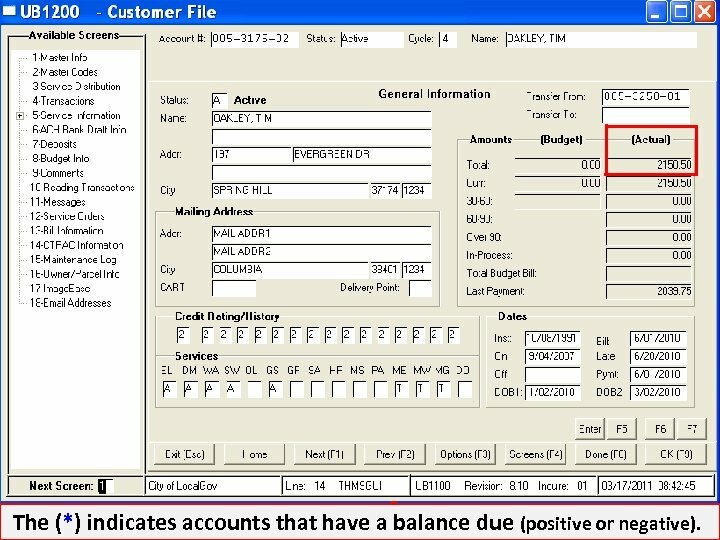 The (*) indicates accounts that have a balance due (positive or negative). 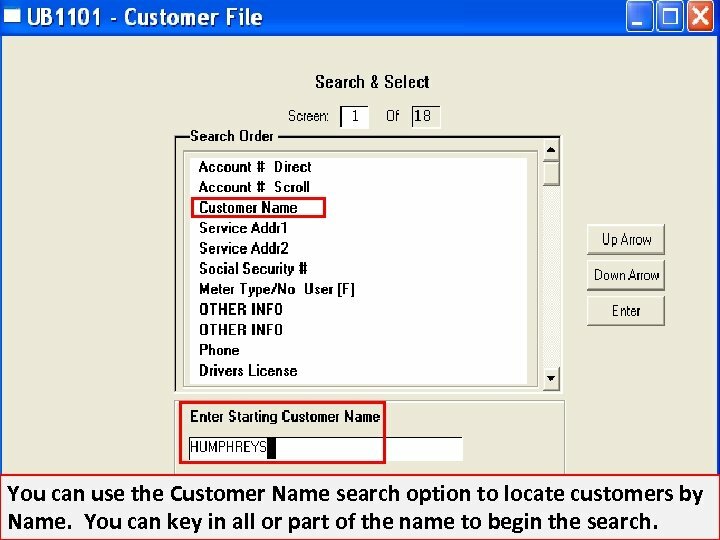 You can use the Customer Name search option to locate customers by Name. You can key in all or part of the name to begin the search. Once you locate the account you are searching for you can select that account (by using the up or down arrow) or by simply double-clicking the account in the list. Once you select the account it will open that accounts screen 1 and show you the details available there. Question – what does the “s” mean ? When you search by Customer Name it searches both the First and Second Name Fields. 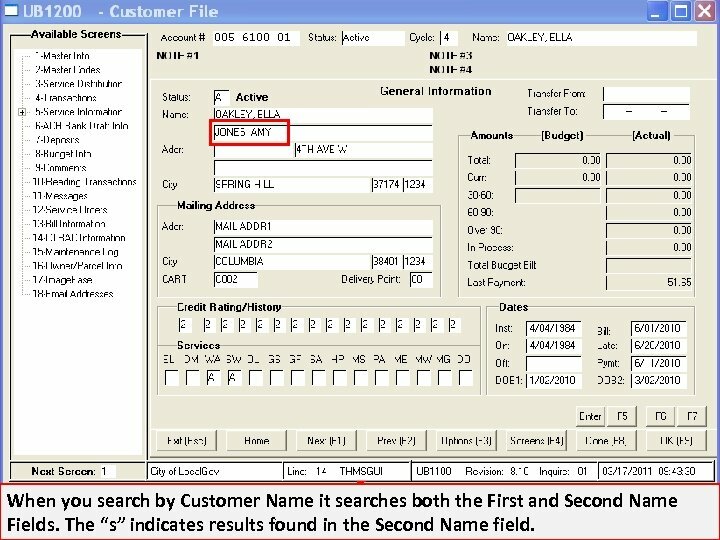 The “s” indicates results found in the Second Name field. • When you search by Customer Name you will need to consider the exact format that your site enters the customer name data (examples below). JOHN SMITH, JOHN JR. 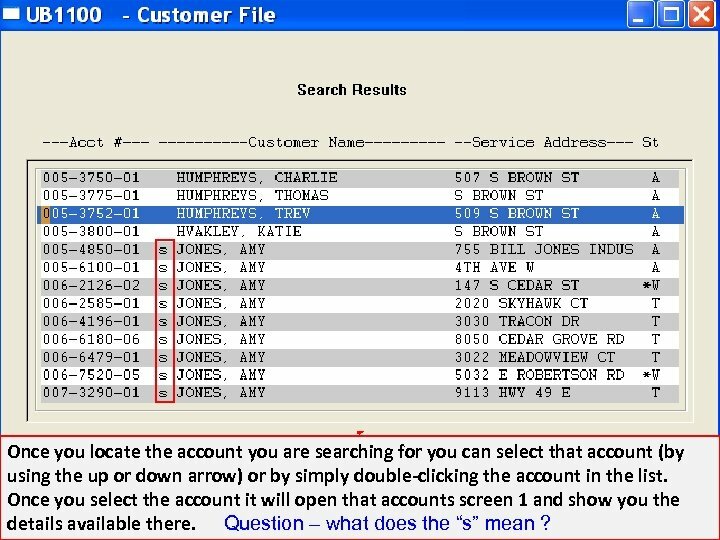 The closer you can match the format the customer name is actually entered in the more successful your customer name search will be. 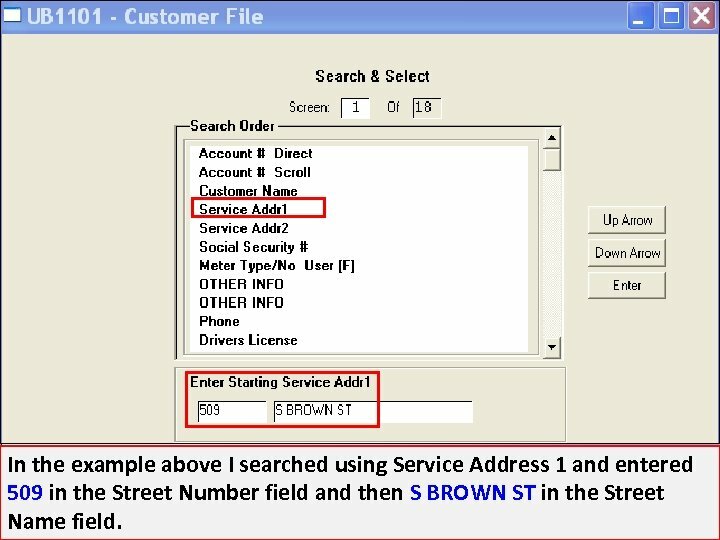 You can also search for accounts by using the Service Address 1 and Service Address 2 fields. 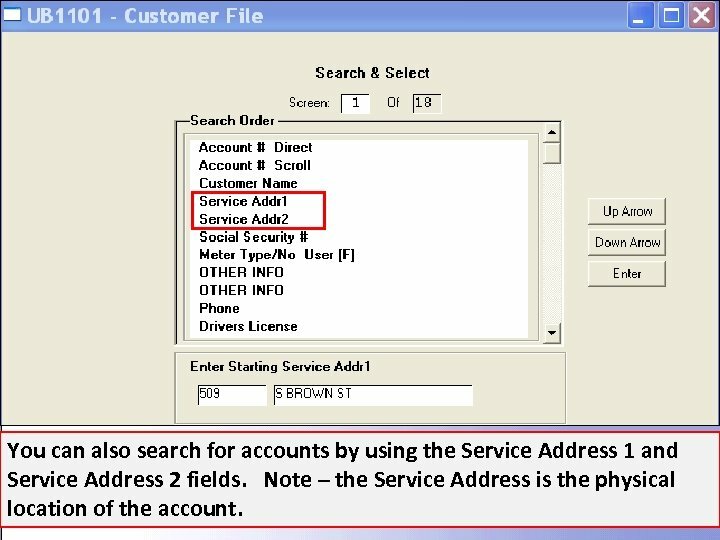 Note – the Service Address is the physical location of the account. 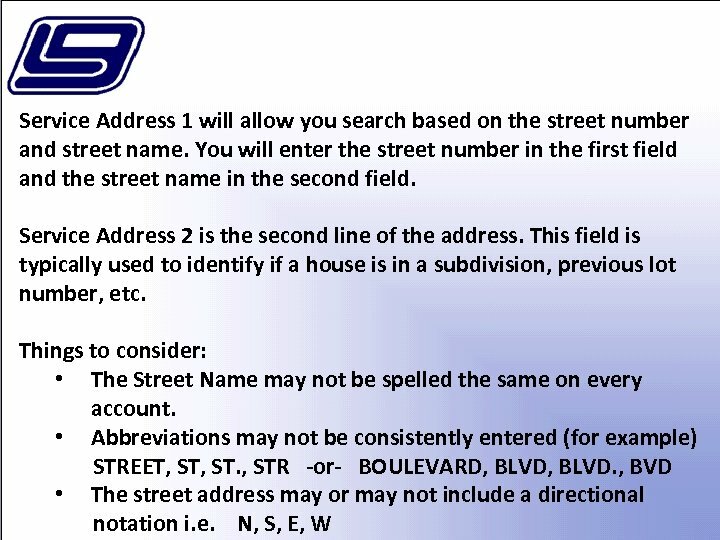 In the example above I searched using Service Address 1 and entered 509 in the Street Number field and then S BROWN ST in the Street Name field. 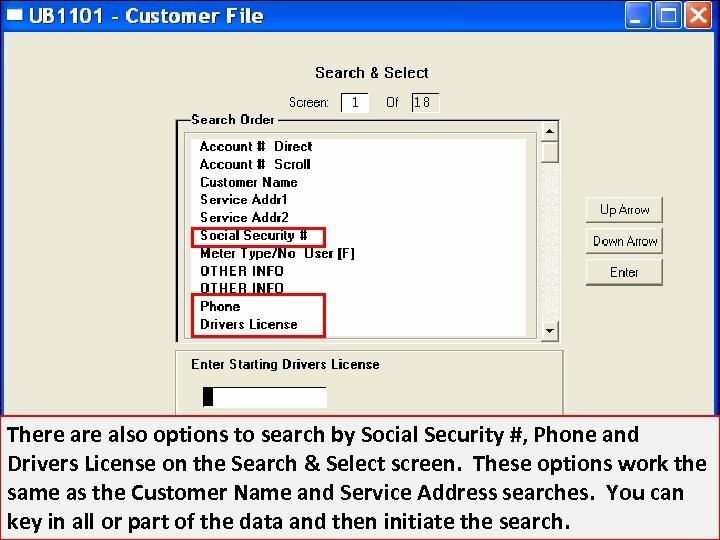 There also options to search by Social Security #, Phone and Drivers License on the Search & Select screen. These options work the same as the Customer Name and Service Address searches. 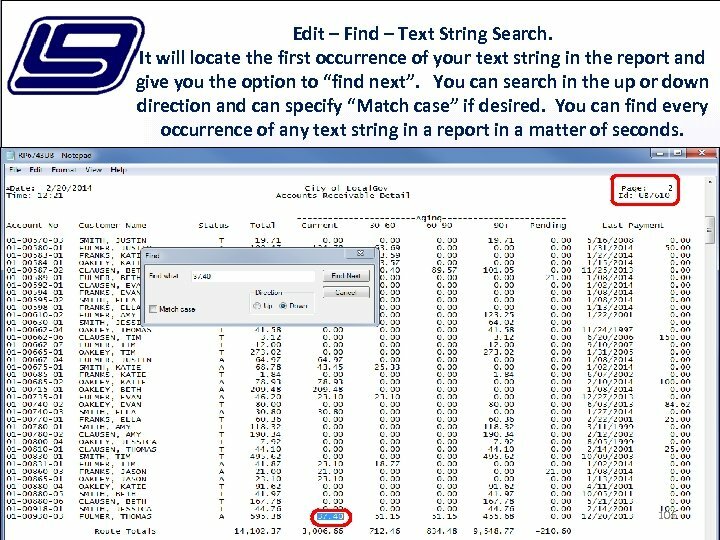 You can key in all or part of the data and then initiate the search. 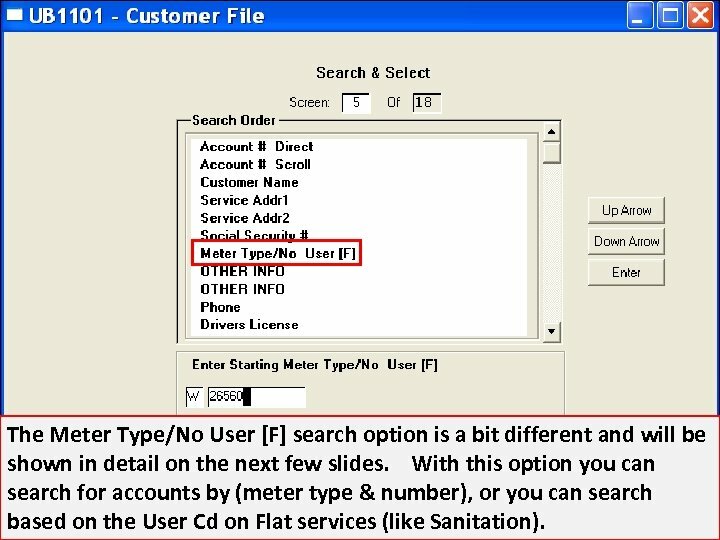 The Meter Type/No User [F] search option is a bit different and will be shown in detail on the next few slides. 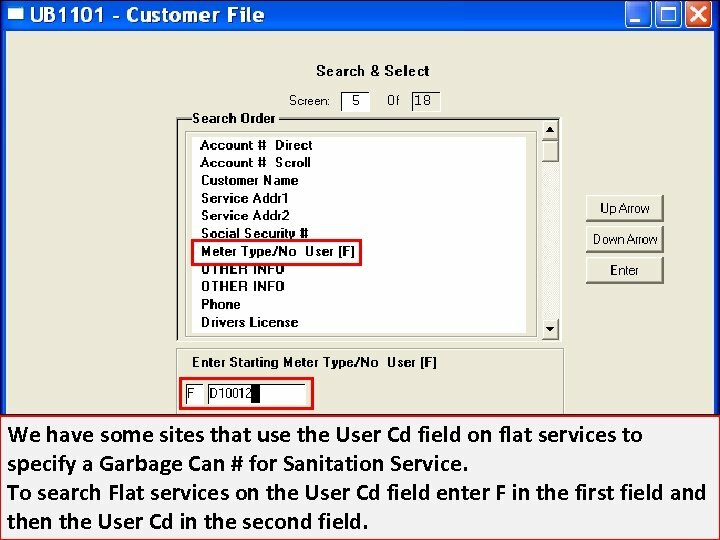 With this option you can search for accounts by (meter type & number), or you can search based on the User Cd on Flat services (like Sanitation). 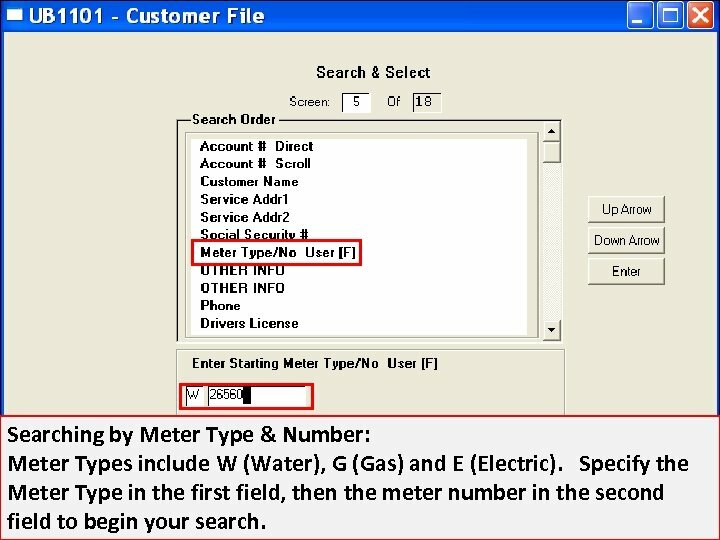 Searching by Meter Type & Number: Meter Types include W (Water), G (Gas) and E (Electric). 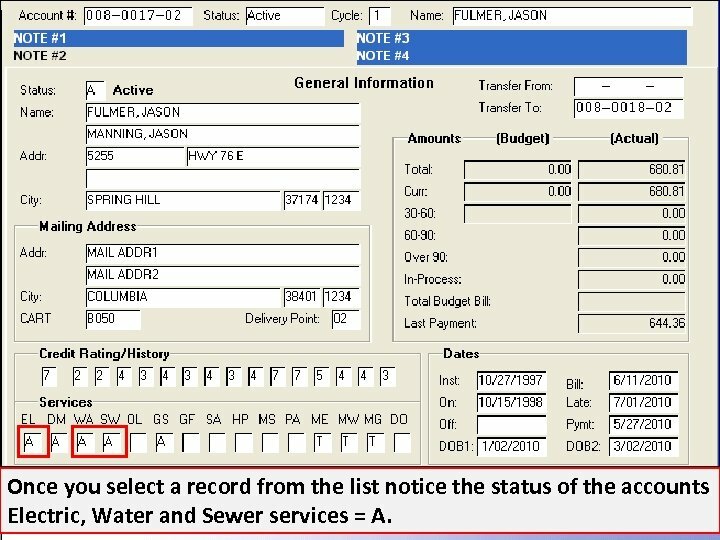 Specify the Meter Type in the first field, then the meter number in the second field to begin your search. 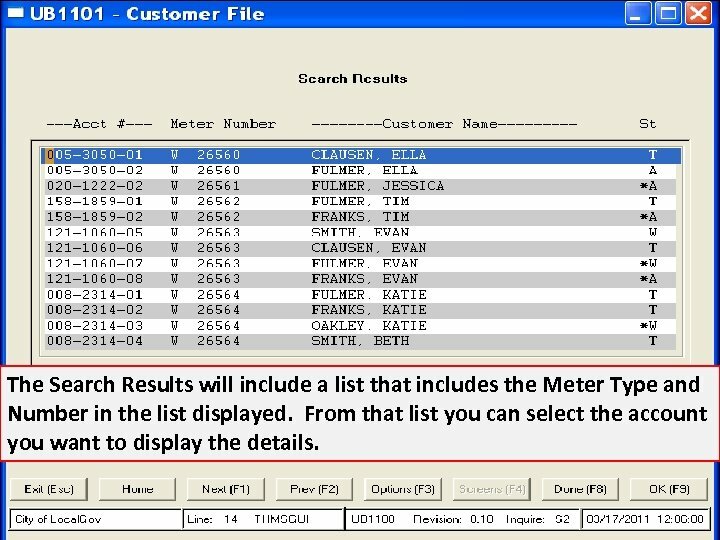 The Search Results will include a list that includes the Meter Type and Number in the list displayed. From that list you can select the account you want to display the details. 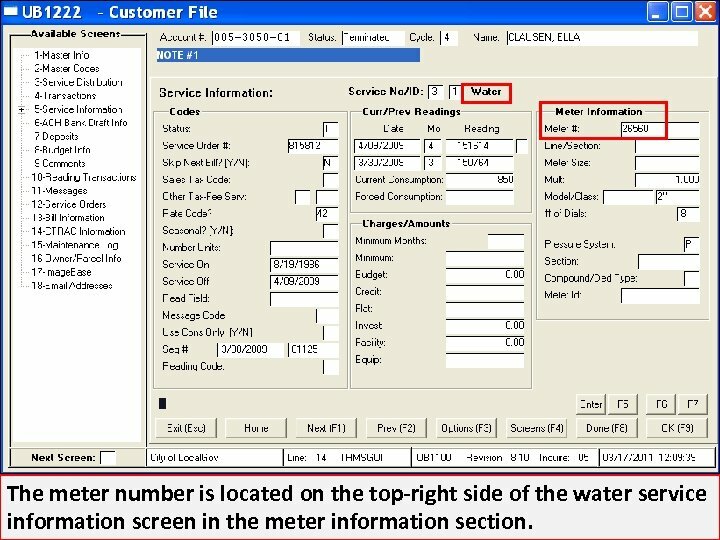 The meter number is located on the top-right side of the water service information screen in the meter information section. We have some sites that use the User Cd field on flat services to specify a Garbage Can # for Sanitation Service. 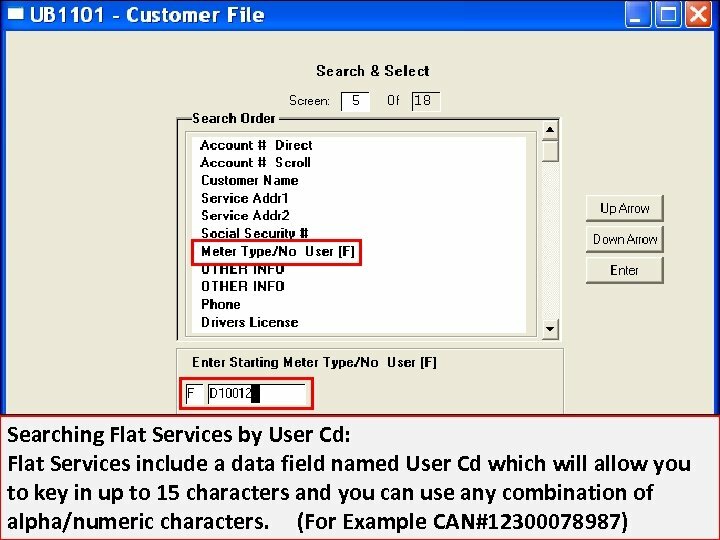 To search Flat services on the User Cd field enter F in the first field and then the User Cd in the second field. 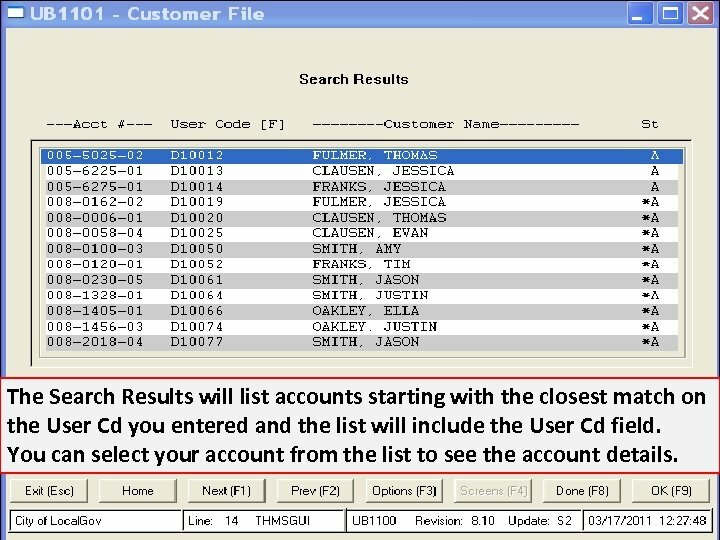 The Search Results will list accounts starting with the closest match on the User Cd you entered and the list will include the User Cd field. You can select your account from the list to see the account details. 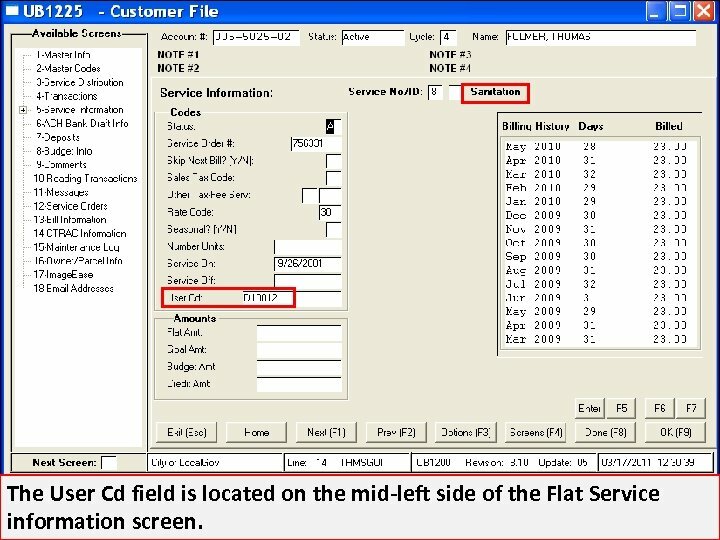 The User Cd field is located on the mid-left side of the Flat Service information screen. 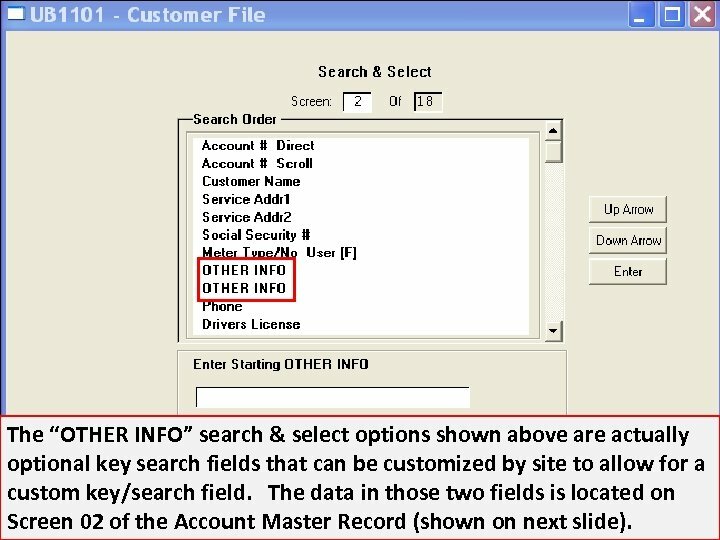 The “OTHER INFO” search & select options shown above are actually optional key search fields that can be customized by site to allow for a custom key/search field. The data in those two fields is located on Screen 02 of the Account Master Record (shown on next slide). 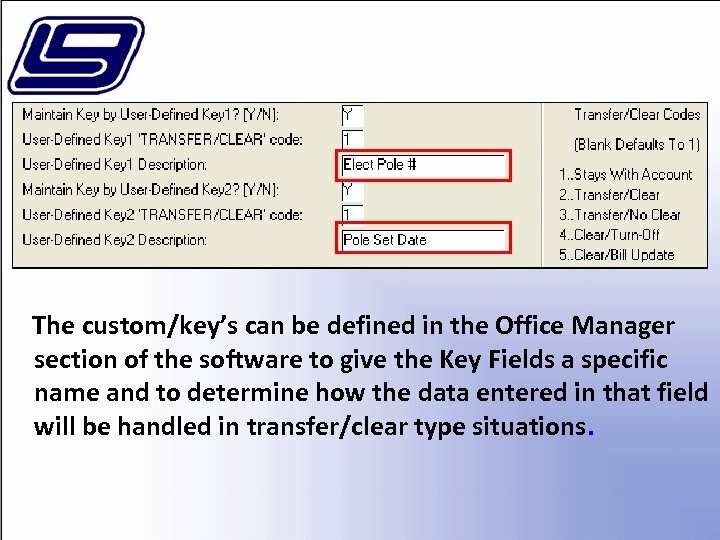 The custom/key’s can be defined in the Office Manager section of the software to give the Key Fields a specific name and to determine how the data entered in that field will be handled in transfer/clear type situations. 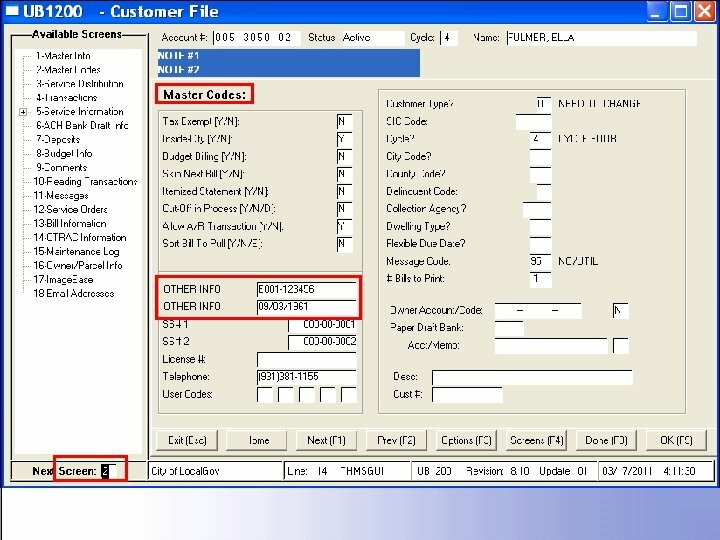 Once defined properly in the Office Manager the custom key field names show up on the Customer Inquiry Search & Select screen and you can search for customer accounts based on the data stored in those fields. 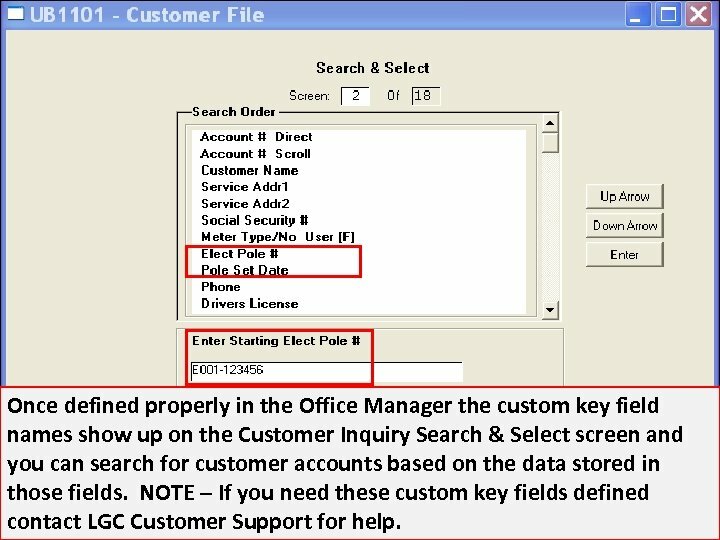 NOTE – If you need these custom key fields defined contact LGC Customer Support for help. 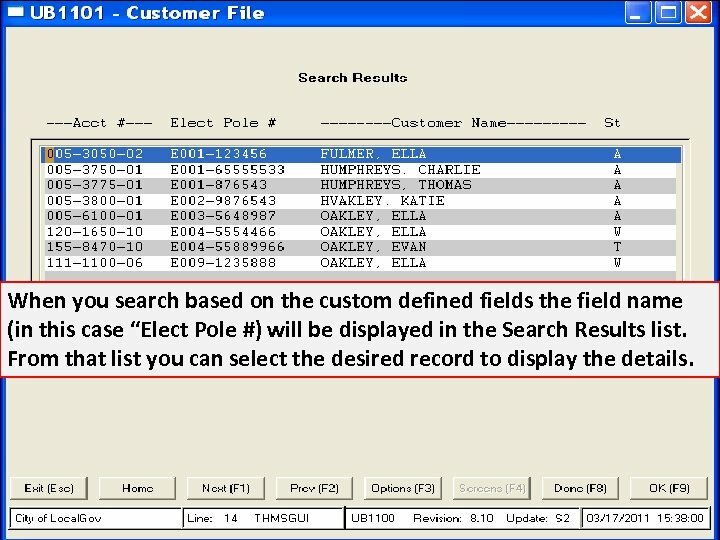 When you search based on the custom defined fields the field name (in this case “Elect Pole #) will be displayed in the Search Results list. 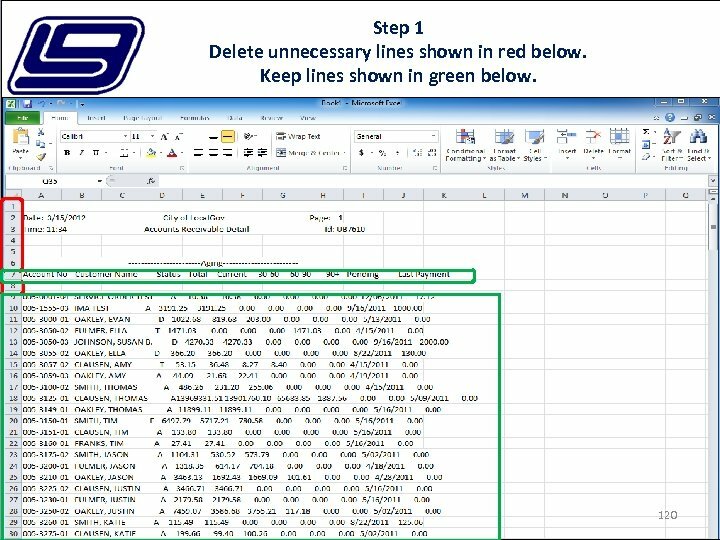 From that list you can select the desired record to display the details. 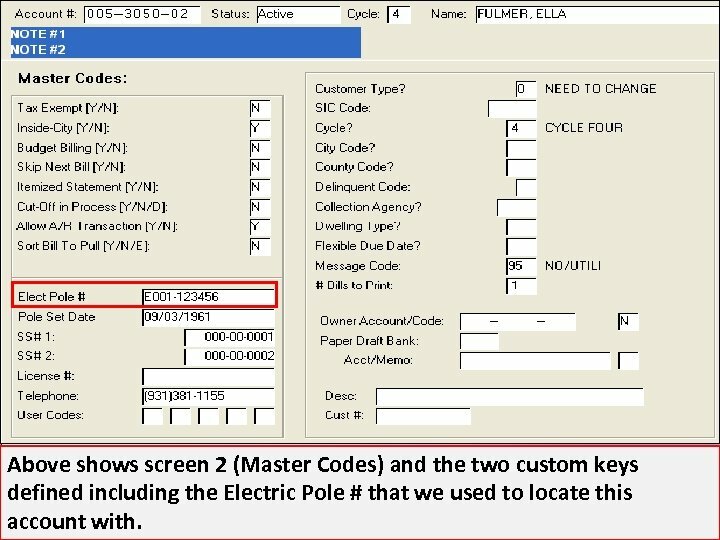 Above shows screen 2 (Master Codes) and the two custom keys defined including the Electric Pole # that we used to locate this account with. 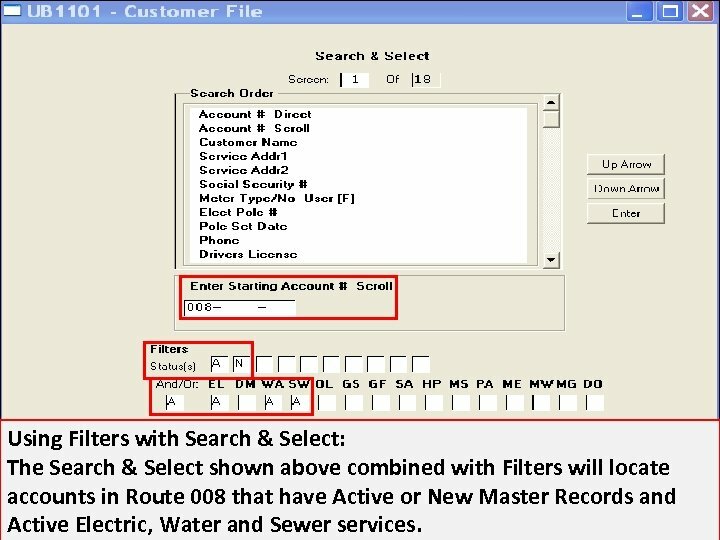 Using Filters with Search & Select: The Search & Select shown above combined with Filters will locate accounts in Route 008 that have Active or New Master Records and Active Electric, Water and Sewer services. 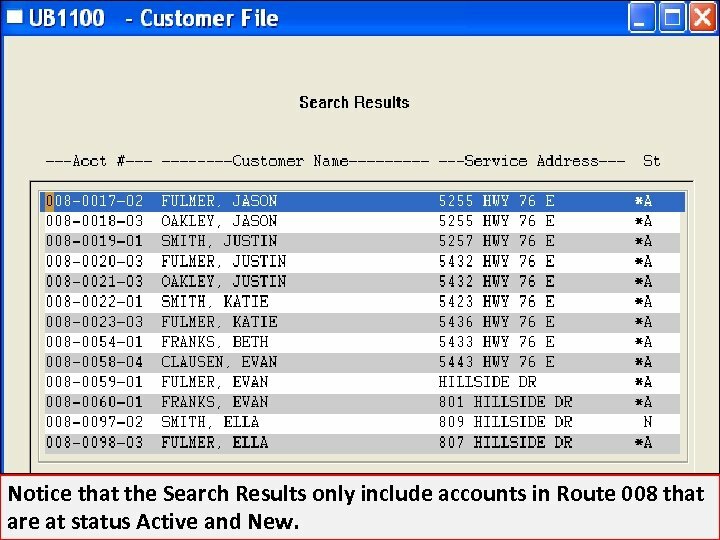 Notice that the Search Results only include accounts in Route 008 that are at status Active and New. 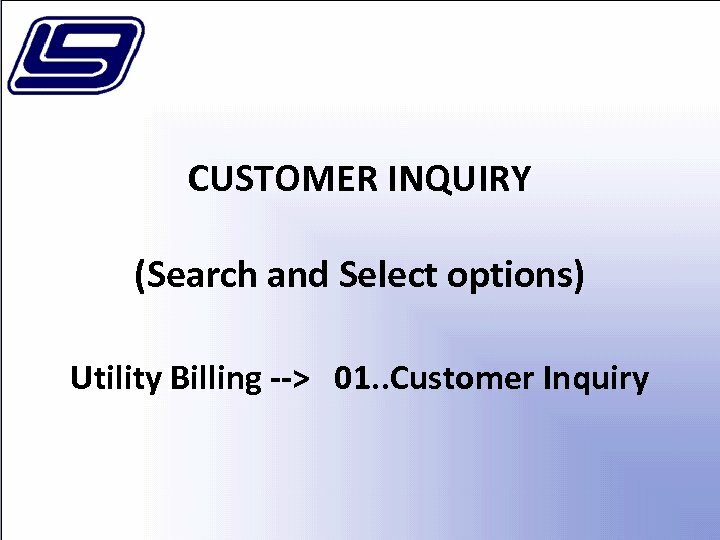 Once you select a record from the list notice the status of the accounts Electric, Water and Sewer services = A. 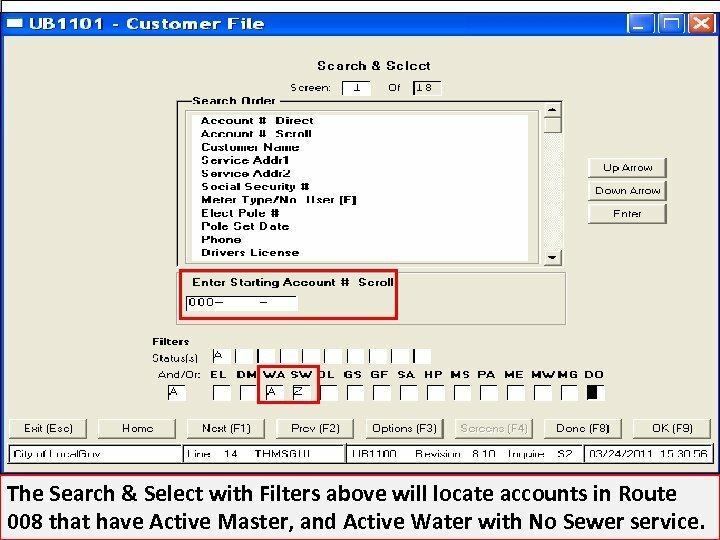 The Search & Select with Filters above will locate accounts in Route 008 that have Active Master, and Active Water with No Sewer service. General Information Screen 1 of Customer Inquiry Note when you locate the account either direct by the account number or by using one of the other search & select options Screen 1 the General Information screen will be the screen that is displayed first. Screen 1 information • The service area is just a quick view of the services that are listed on the account and the status. • The Transfer from and To fields are used if the customer has had service at a previous location or if the customer has moved to a new location. 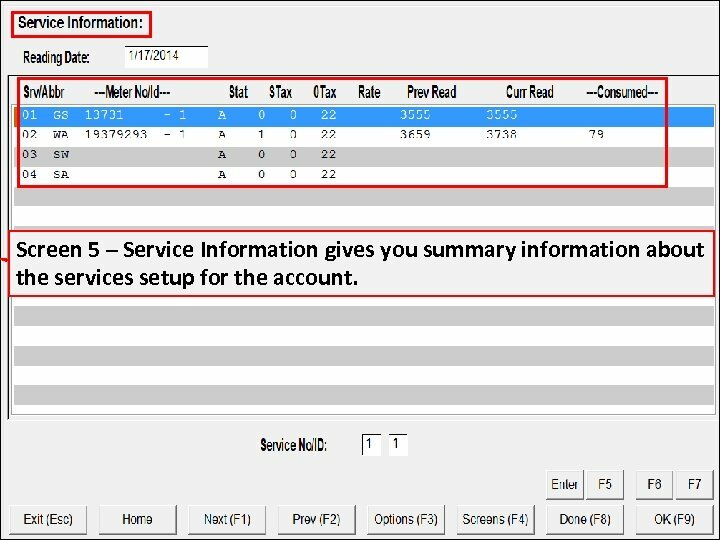 If your site uses Service Orders, or File Maintenance – New Customer or Turn On/Off options this is normally where the transfer (from and to) account information is entered. Screen 1 information • The Amounts (Budget and Actual) shows details of balanced due for the account. There are two areas the Budget amount and the Actual Amount. • The Actual Amount is the balance broken down by total due, current bill, 30 -60, 60 -90, and over 90 days past due. • The Budget Amount is used only if the site uses Budget Billing or Levelized Billing. Screen 1 information • You will also see the In Process amount field, this field will show an amount only if the customer has paid their bill but the packet that contains the payment has not been processed. • The Total Budget Bill is the amount of the customer’s budget bill that they will pay each month. Screen 1 information • The Last payment field shows the amount of the last payment that the customer has made. • The Date area records the dates that the service was installed, turned on and disconnected. Also the last bill date, the late date(delinquent date), last payment date. Also this area has a place for Date of Births. Screen 2 information • The Master Code Screen Contains the tax exempt flag, which can be used to flag an account as exempt from taxes. • The Inside City flag can be used to flag the account as an inside city account. The statistical report will use this flag when showing the details of your billing stats. 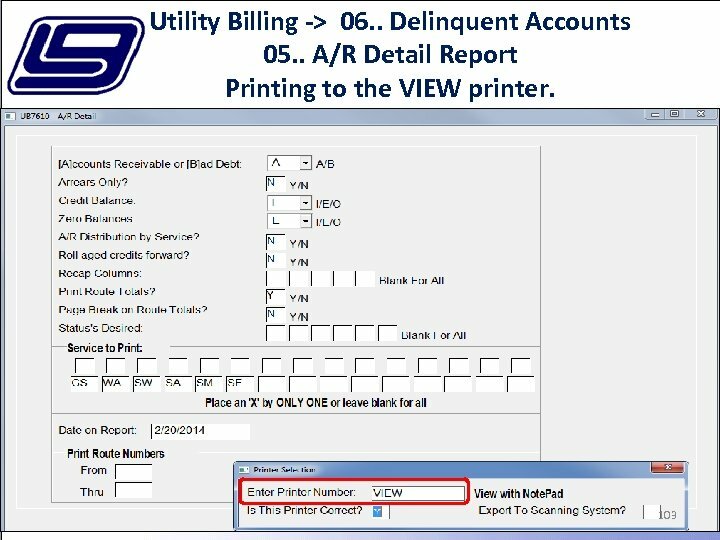 • The Skip next bill flag “Y” allows account to be skipped during the next billing cycle. Some sites elect to skip the next bill in cases of New accounts that have been turned on just prior to a billing cycle based on a minimum number of service days or consumption amount. Screen 2 information • The Skip Next bill field is also used for the seasonal turn on and turn off option for accounts. 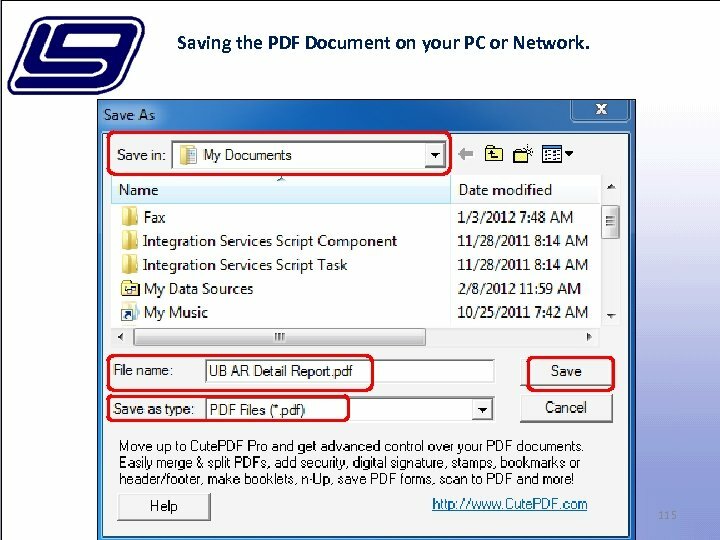 • The Other Information fields are custom alternate keys to the records and can be defined by LGC installers for you to use as needed. 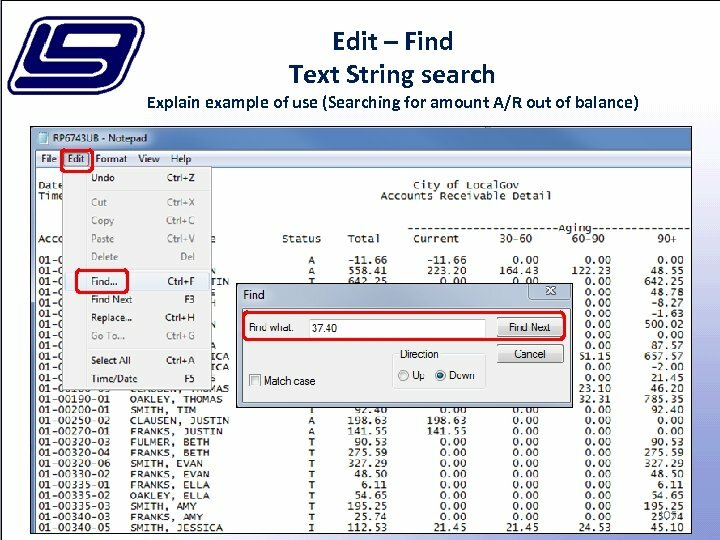 Earlier we showed how they could be used to store and search for accounts by Elect Pole # and Pole Set Date. Screen 2 information • This screen is also used to record the Social Security Numbers, phone numbers and drivers license number of the account holder. • The User Code fields are used to link multiple accounts together that have no other identifying characteristics. These fields are also used by other programs such as the online payment option. If you place an X in the 5 th field this will block the account from being able to make online payments. Screen 2 information • The customer type is also recorded on this screen, such as Residential, Commercial, Industrial, School, Government. • You will also see the cycle that this account is in, the cycle is filled in based on the cycle that the route is in (this is defined in the Office Manager area). Screen 2 information • The collection agency code allows you tell if the account has been sent to a collection agency for default payment. • The dwelling type allows you define what type of structure is receiving the service. 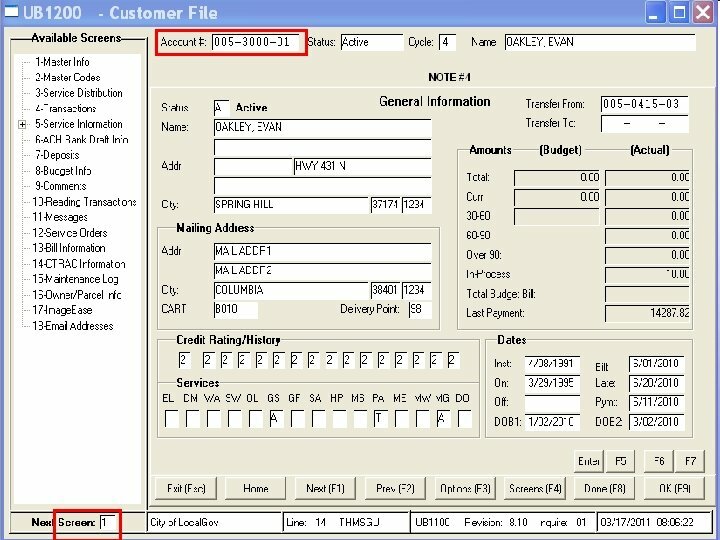 • If the site uses Flexible due dates you will see the code that system uses to determine the due date for the customer. 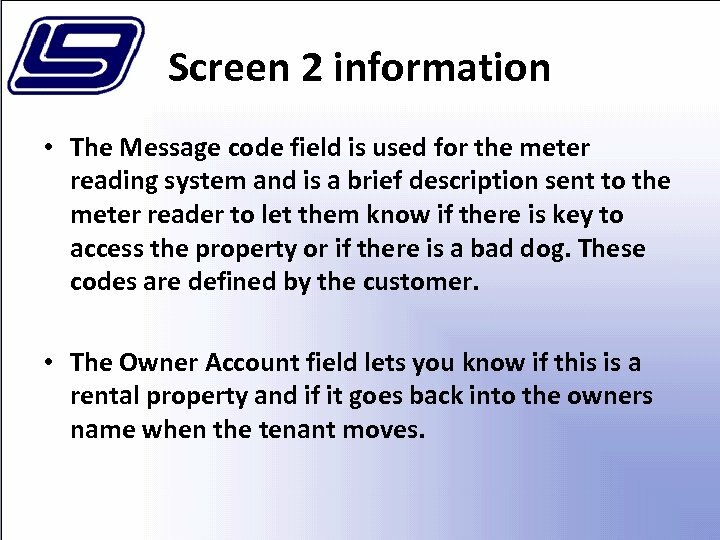 Screen 2 information • The Message code field is used for the meter reading system and is a brief description sent to the meter reader to let them know if there is key to access the property or if there is a bad dog. These codes are defined by the customer. • The Owner Account field lets you know if this is a rental property and if it goes back into the owners name when the tenant moves. 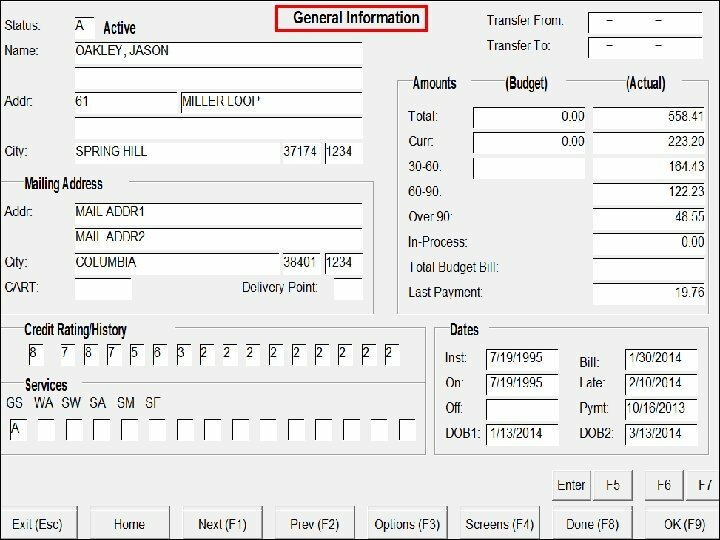 The Transaction Screen allows you to view all transactions that have been posted to the account (by Year) and it also includes the Total Due and Period Balance. 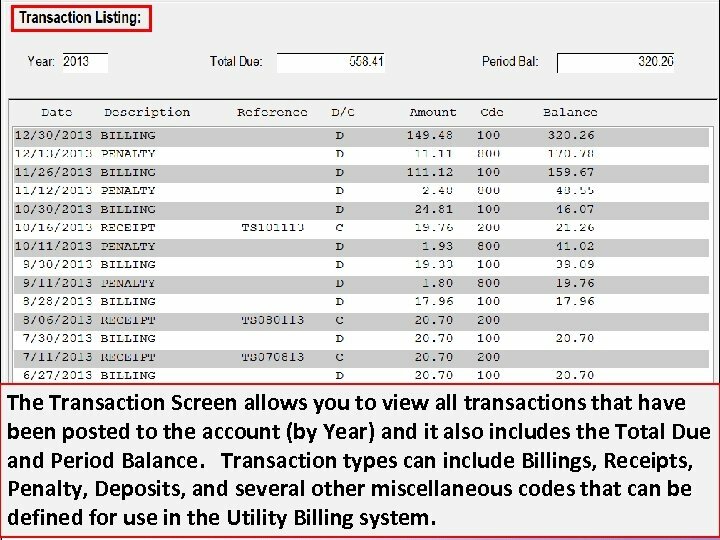 Transaction types can include Billings, Receipts, Penalty, Deposits, and several other miscellaneous codes that can be defined for use in the Utility Billing system. 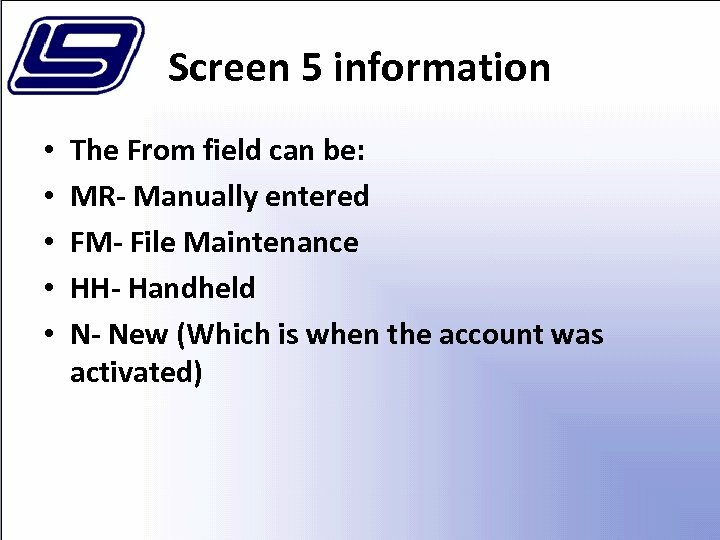 Screen 5 – Service Information gives you summary information about the services setup for the account. Screen 5 information • To see the service details select the service you wish to view. 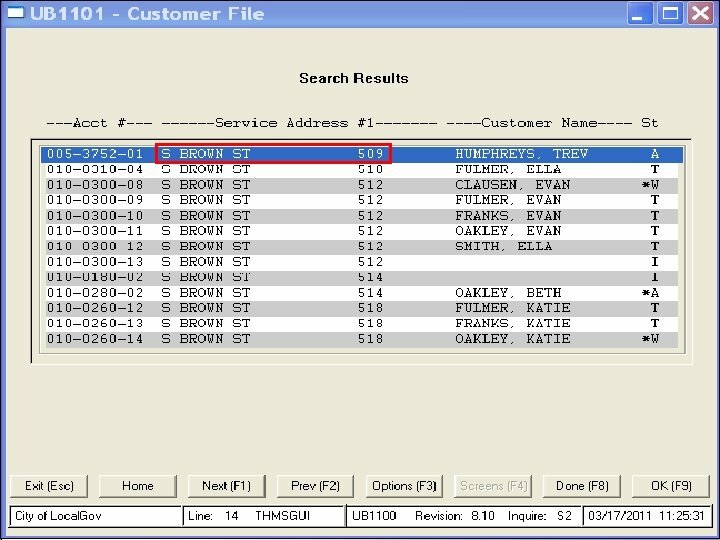 • This view allows you to see the service order number that was last used on this service. • The Skip Next bill flag for this service. • The Seasonal Flag is also set here. • The number of units on this account. Screen 5 information • Number of Units is often used for sanitation and is the number of trash cans the customer has at the location. This will affect the billing. • The dates of service turn on and turn off are also listed. 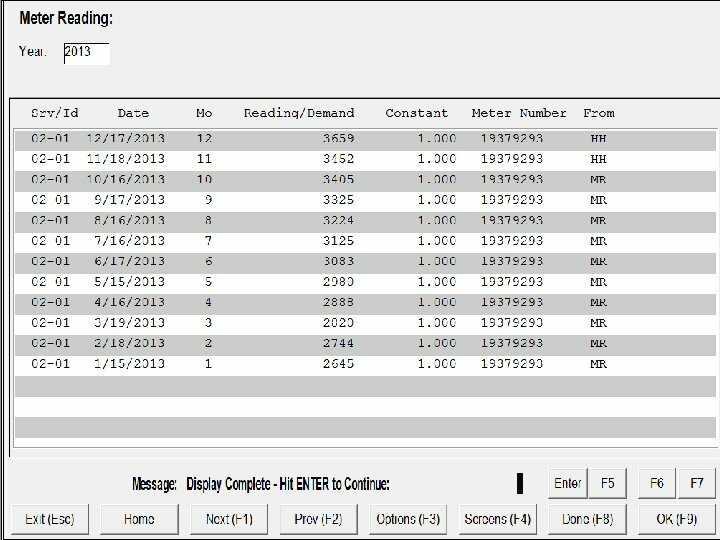 • The read field is used with radio read meters. • The message code is a specific message sent out to the hand held meter reading system to pass a message on to the meter reader such as (meter behind house). Screen 5 information • You also see the meter read dates, read month and readings of the current and previous readings. • The Meter Size is also listed on this screen and the Multiplier. Screen 5 information • If you press the F 5 button on the Service detail screen you will be able to view the reading/billing history for the service. • You will see the number of days on this billing, the heat/cool days, the billing date, reading, consumption and the bill amount. Screen 5 information • If you press the F 6 button on the Service detail screen you will be able to view the reading transactions for the service. 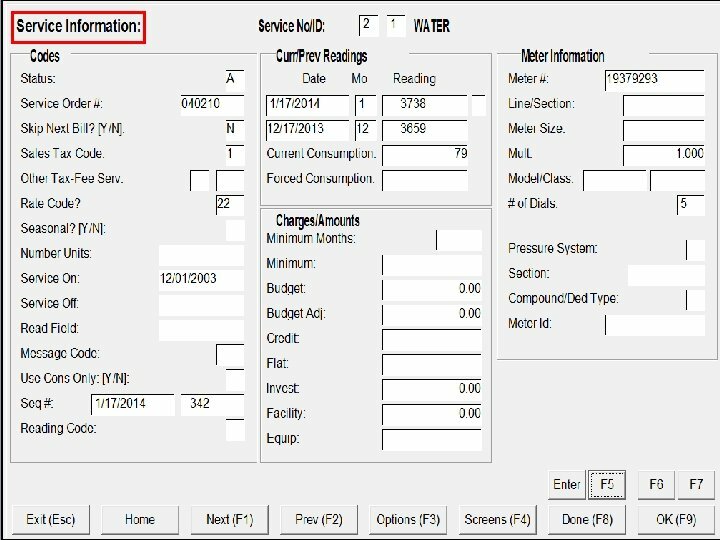 • You will see the service number, the date of the reading, the reading month, reading for that month, the constant for the meter, which is the multiplier, the meter number and how the reading was obtained will be shown in the “From” field. Screen 13 information • Screen 13 is the bill information screen, this screen allows you to view past bills, manually calculate a bill and see an in process bill. 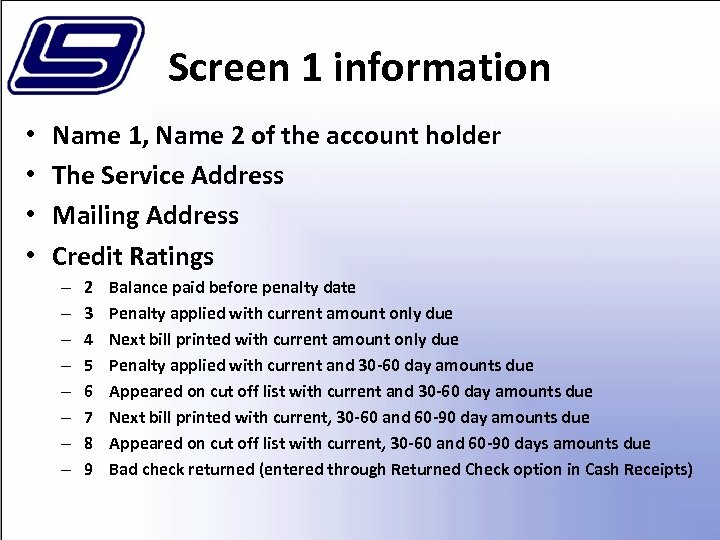 • To view the last bill the customer received use L when you first enter the screen number. To view previous bills you may press F 1 button and to go forward you may press the F 2 button. 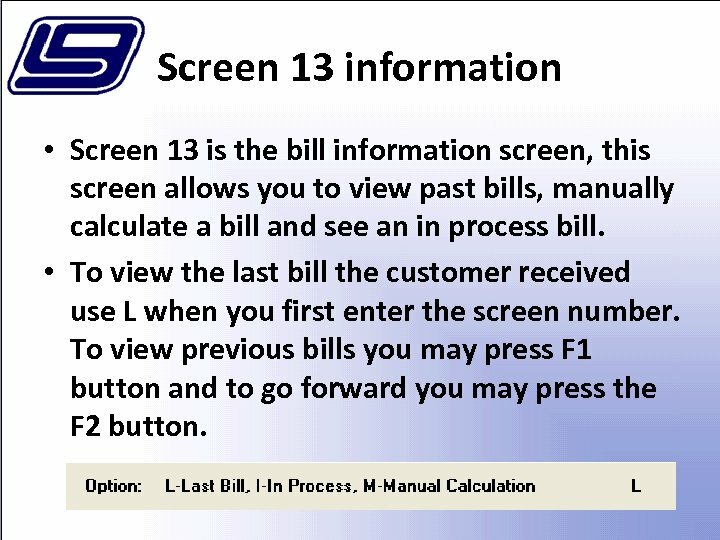 Screen 13 information • To manually calculate a bill, you will place an M on the screen when first entered. 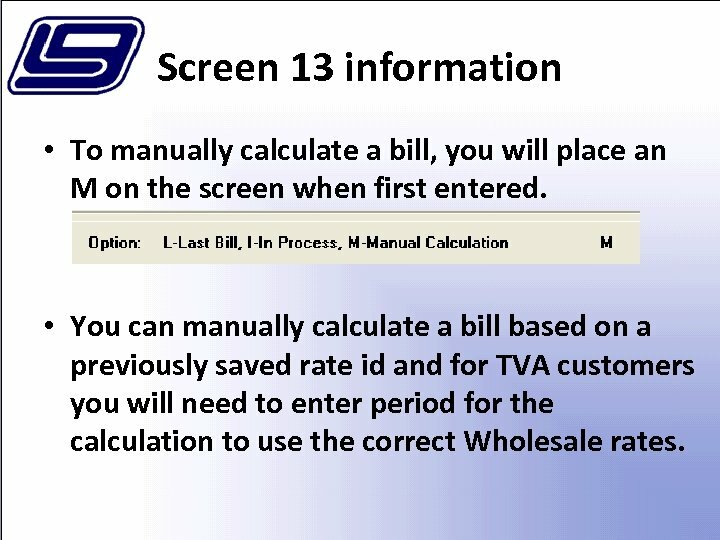 • You can manually calculate a bill based on a previously saved rate id and for TVA customers you will need to enter period for the calculation to use the correct Wholesale rates. 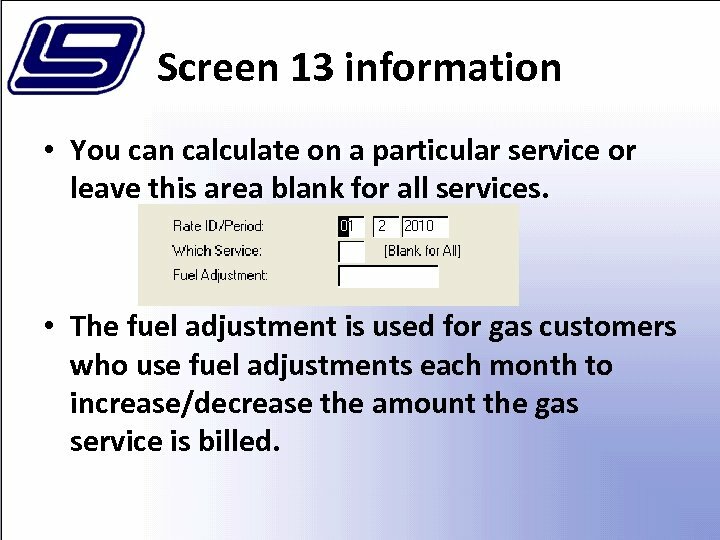 Screen 13 information • You can calculate on a particular service or leave this area blank for all services. • The fuel adjustment is used for gas customers who use fuel adjustments each month to increase/decrease the amount the gas service is billed. Screen 13 information • You can calculate the bill by manually entering the consumption or entering the rate and consumption manually. • You may also use the current months readings, for example if someone is inquiring about their bill before the billing is complete. Screen 13 information • You can also see a simulated bill based on history readings from screen 5. The history occurrence to use is from the top down and is numerically 1 -15. In this session we will cover: Generating some of the more frequently used reports in the Utility Billing -> “Miscellaneous Reports” sub-menu and we will VIEW and discuss the report examples. 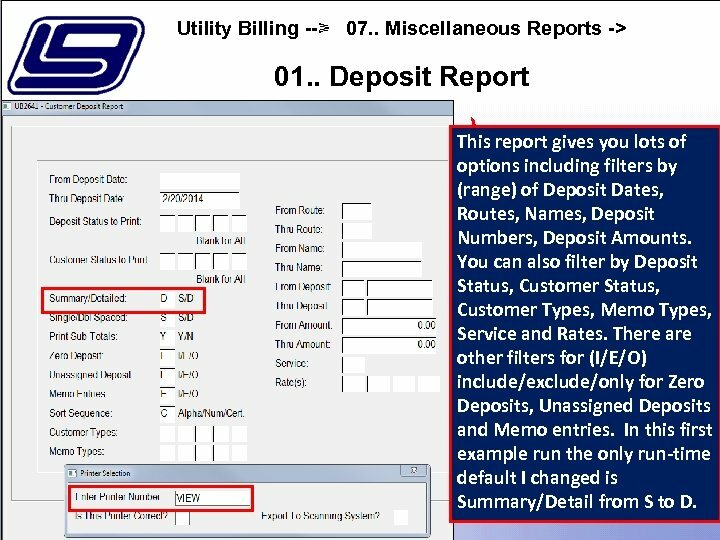 Utility Billing --> 07. . Miscellaneous Reports -> 01. . Deposit Report This report gives you lots of options including filters by (range) of Deposit Dates, Routes, Names, Deposit Numbers, Deposit Amounts. You can also filter by Deposit Status, Customer Types, Memo Types, Service and Rates. 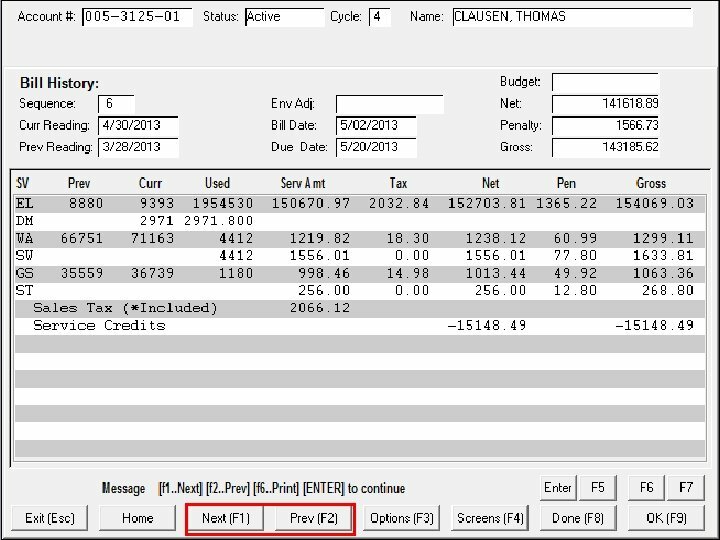 There are other filters for (I/E/O) include/exclude/only for Zero Deposits, Unassigned Deposits and Memo entries. 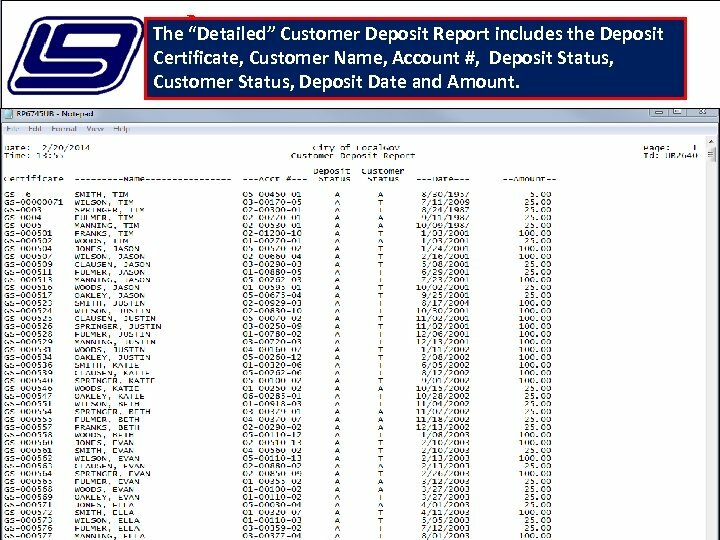 In this first example run the only run-time default I changed is Summary/Detail from S to D.
The “Detailed” Customer Deposit Report includes the Deposit Certificate, Customer Name, Account #, Deposit Status, Customer Status, Deposit Date and Amount. 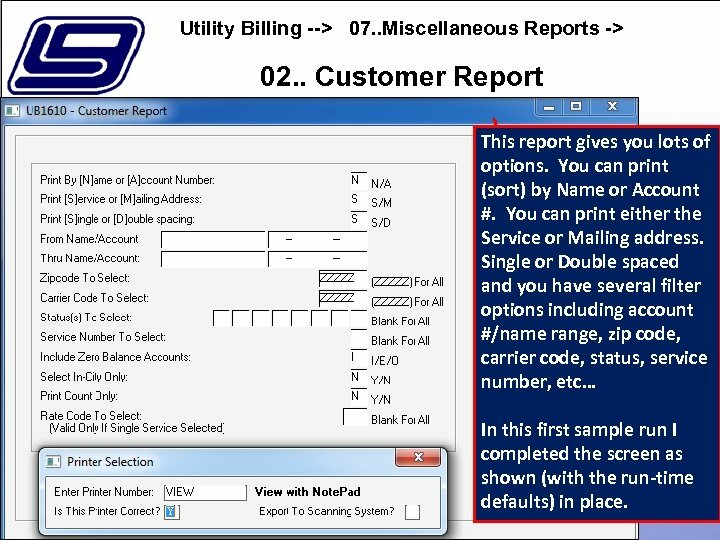 Utility Billing --> 07. . Miscellaneous Reports -> 02. . Customer Report This report gives you lots of options. You can print (sort) by Name or Account #. 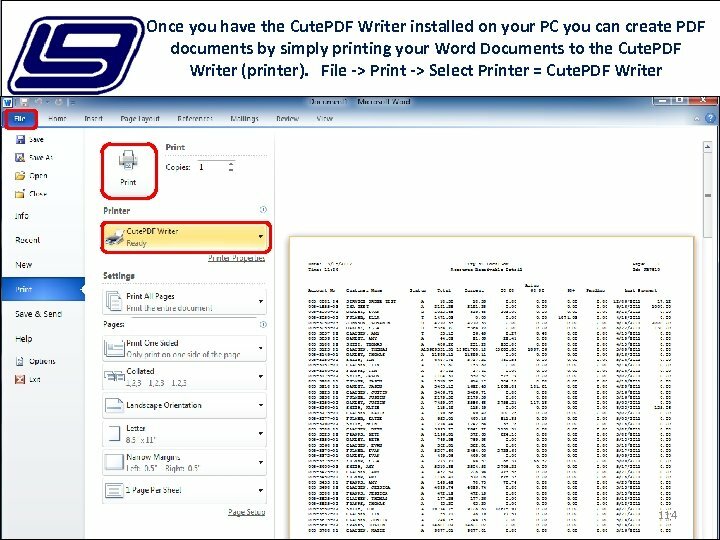 You can print either the Service or Mailing address. 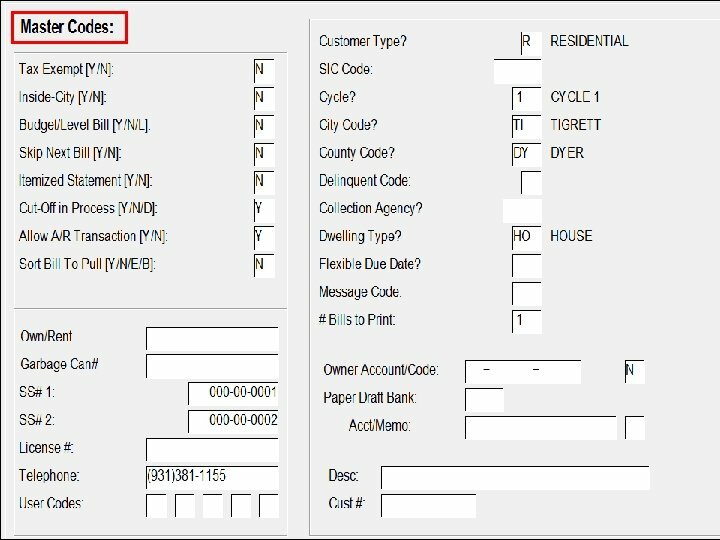 Single or Double spaced and you have several filter options including account #/name range, zip code, carrier code, status, service number, etc… In this first sample run I completed the screen as shown (with the run-time defaults) in place. 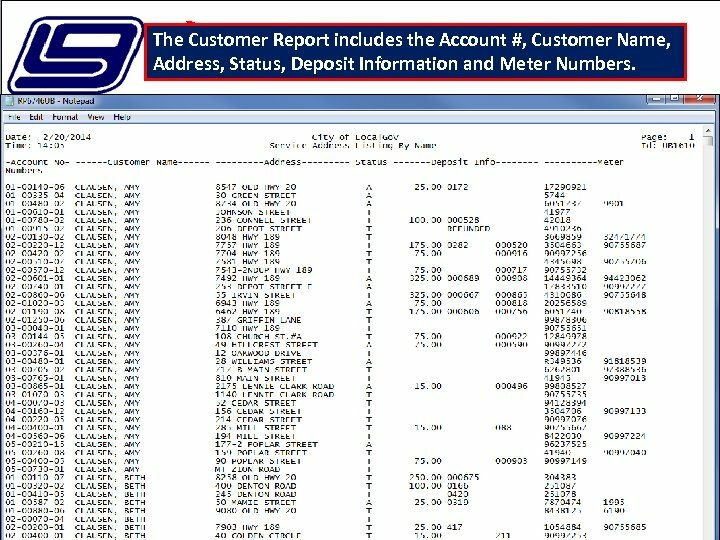 The Customer Report includes the Account #, Customer Name, Address, Status, Deposit Information and Meter Numbers. Utility Billing --> 07. . Miscellaneous Reports -> 02. . 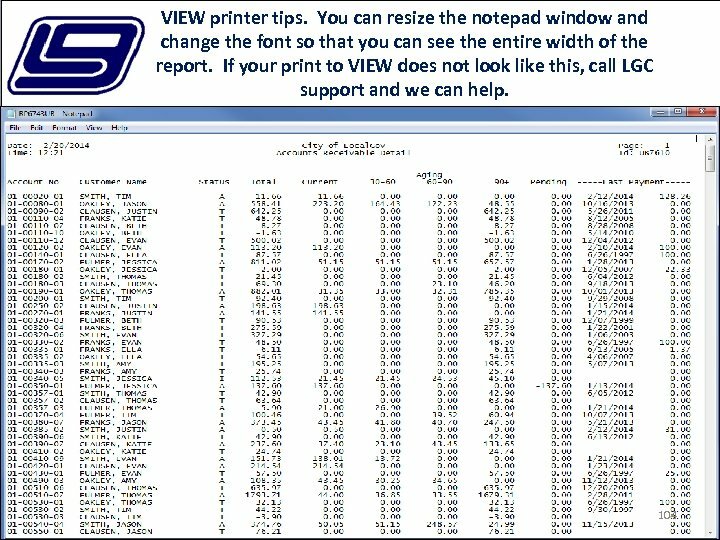 Customer Report (Second run example) This time I left all of the run -time defaults in place except for I changed the Print Count Only to Y. 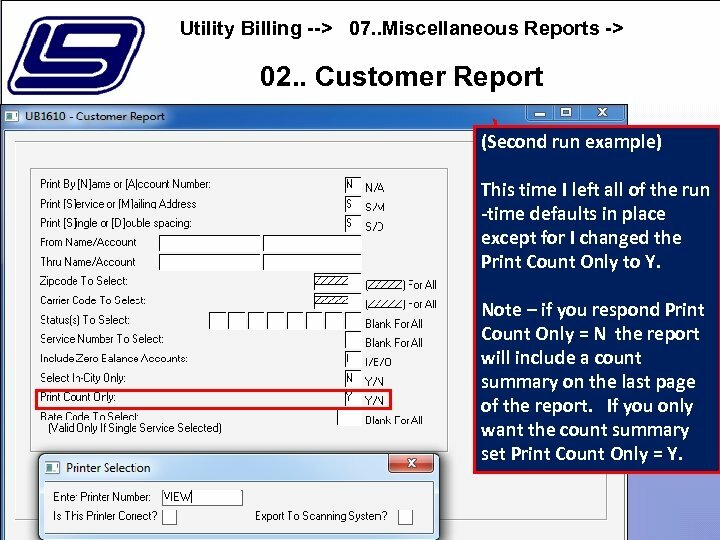 Note – if you respond Print Count Only = N the report will include a count summary on the last page of the report. If you only want the count summary set Print Count Only = Y. If you ever have a need to report on the number of customers by status, this report will do the job. 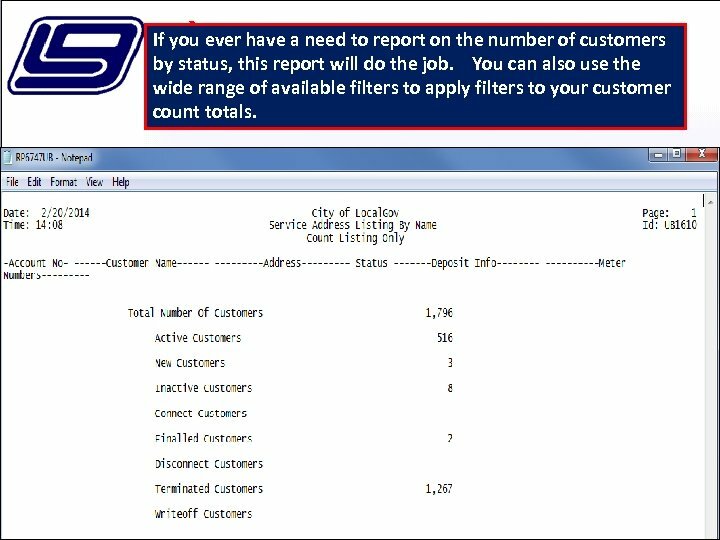 You can also use the wide range of available filters to apply filters to your customer count totals. Utility Billing --> 07. . Miscellaneous Reports -> 07. . 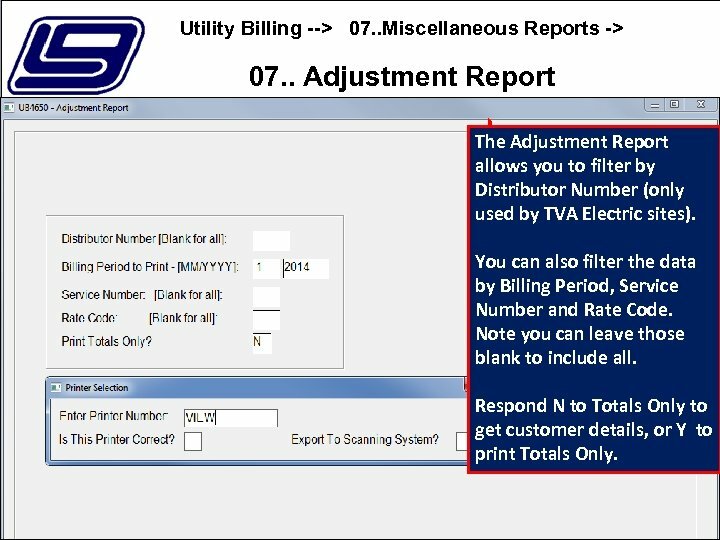 Adjustment Report The Adjustment Report allows you to filter by Distributor Number (only used by TVA Electric sites). 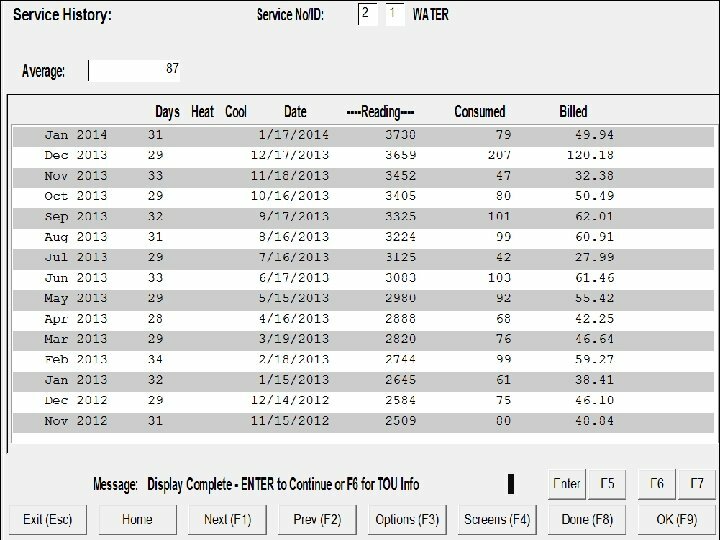 You can also filter the data by Billing Period, Service Number and Rate Code. Note you can leave those blank to include all. 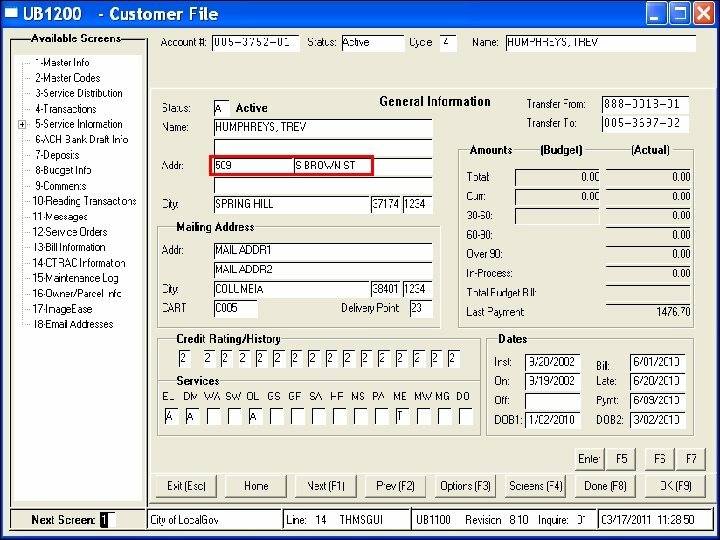 Respond N to Totals Only to get customer details, or Y to print Totals Only. 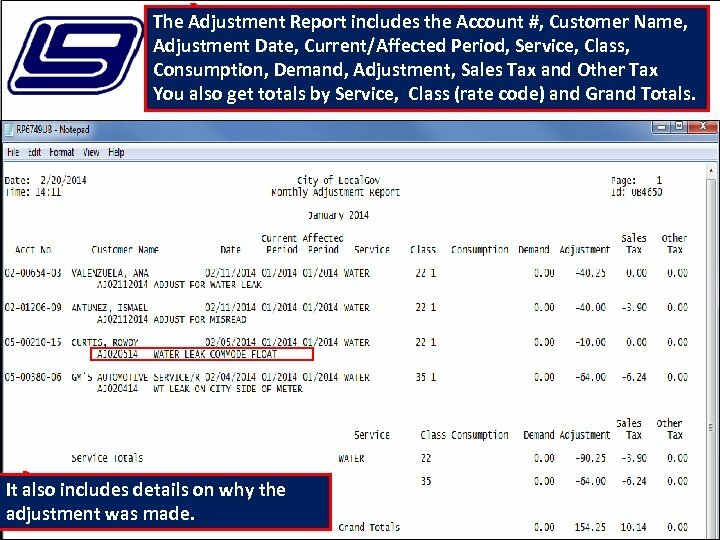 The Adjustment Report includes the Account #, Customer Name, Adjustment Date, Current/Affected Period, Service, Class, Consumption, Demand, Adjustment, Sales Tax and Other Tax You also get totals by Service, Class (rate code) and Grand Totals. It also includes details on why the adjustment was made. 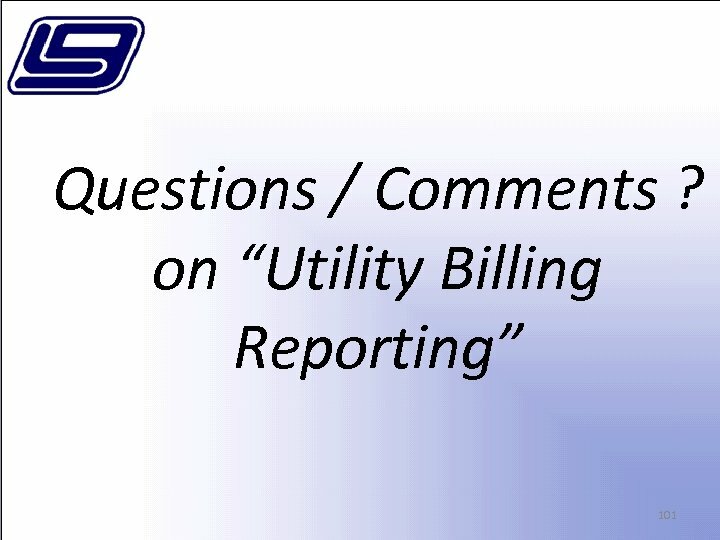 Utility Billing --> 07. . Miscellaneous Reports -> 13. . Selective Report by Service The Selective Report by Service allows you to filter by Cycle or a range of Routes. 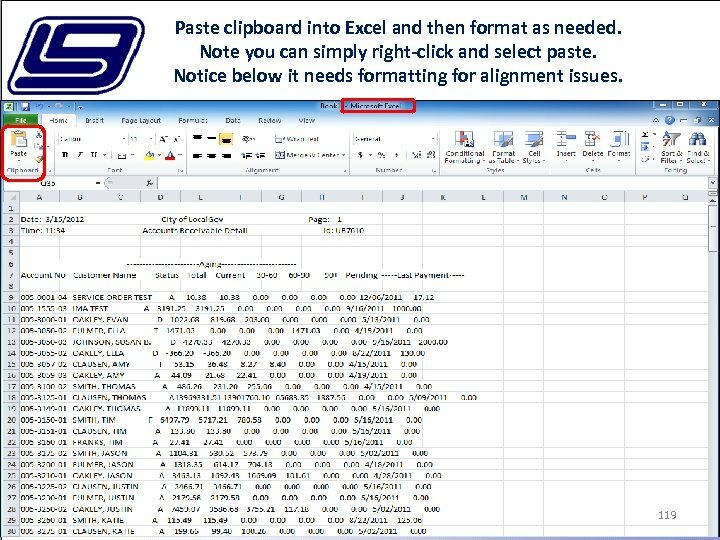 You have to select a service to print and you have a broad selection of filters including Customer Type, Sales Tax Code, Rate Code (range), Status, In-City code, City Code. By default it will include the history month 1 only. In this sample run I left all of the run-time defaults as they were except I specified Service to Print “ 1”. 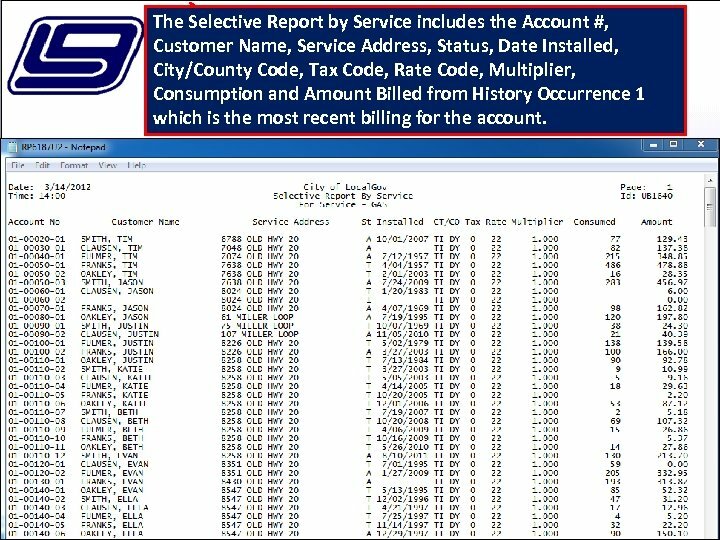 The Selective Report by Service includes the Account #, Customer Name, Service Address, Status, Date Installed, City/County Code, Tax Code, Rate Code, Multiplier, Consumption and Amount Billed from History Occurrence 1 which is the most recent billing for the account. Utility Billing --> 07. . Miscellaneous Reports -> 13. . 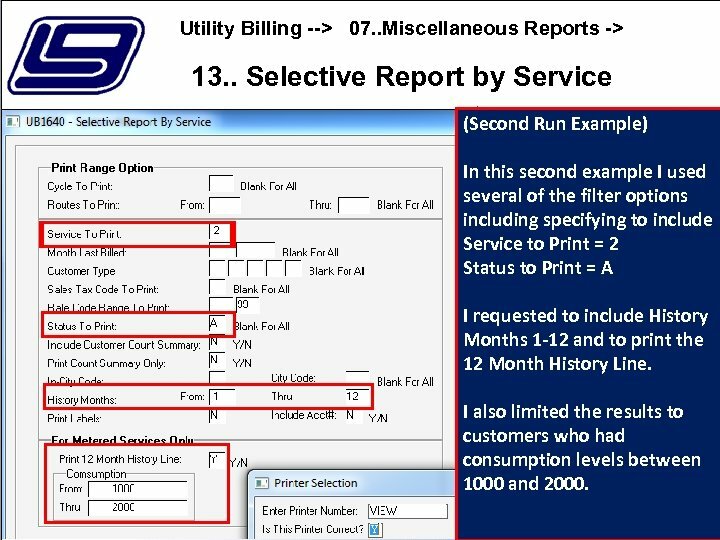 Selective Report by Service (Second Run Example) In this second example I used several of the filter options including specifying to include Service to Print = 2 Status to Print = A I requested to include History Months 1 -12 and to print the 12 Month History Line. 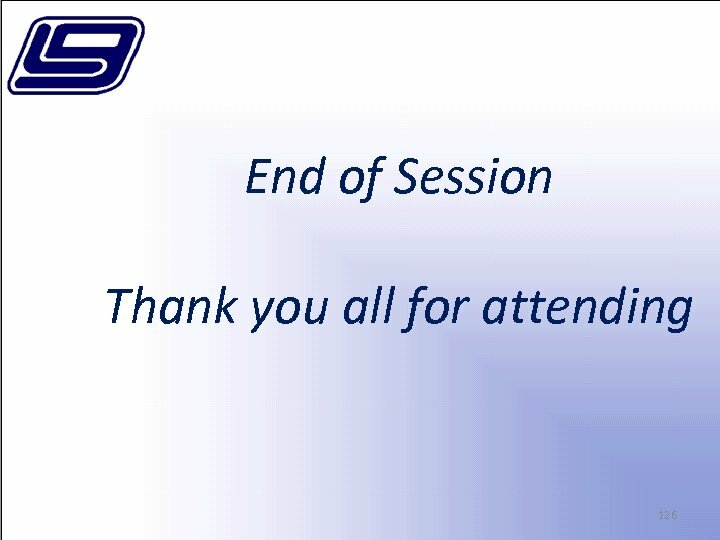 I also limited the results to customers who had consumption levels between 1000 and 2000. 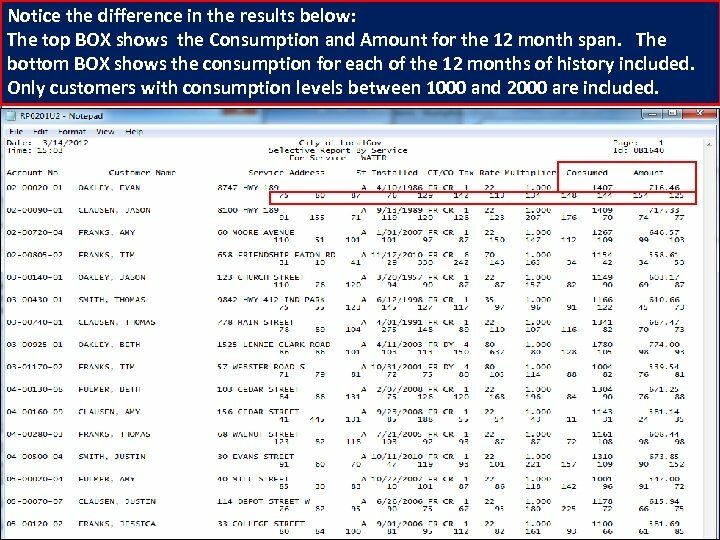 Notice the difference in the results below: The top BOX shows the Consumption and Amount for the 12 month span. The bottom BOX shows the consumption for each of the 12 months of history included. Only customers with consumption levels between 1000 and 2000 are included. Utility Billing --> 07. . Miscellaneous Reports -> 13. . 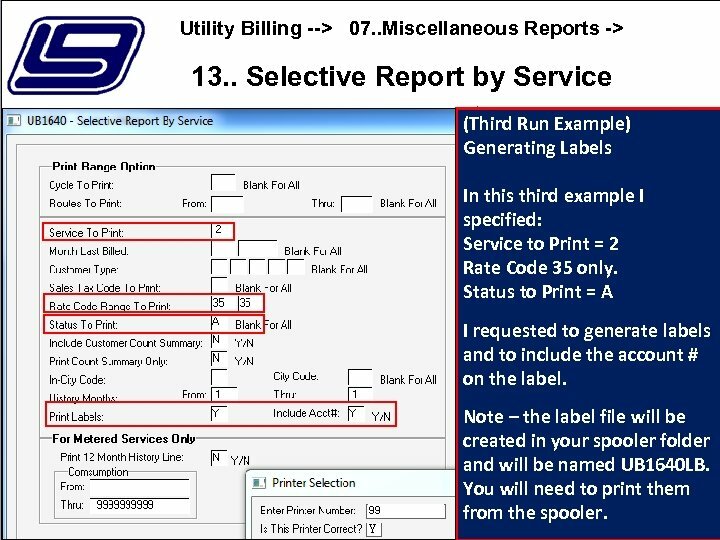 Selective Report by Service (Third Run Example) Generating Labels In this third example I specified: Service to Print = 2 Rate Code 35 only. 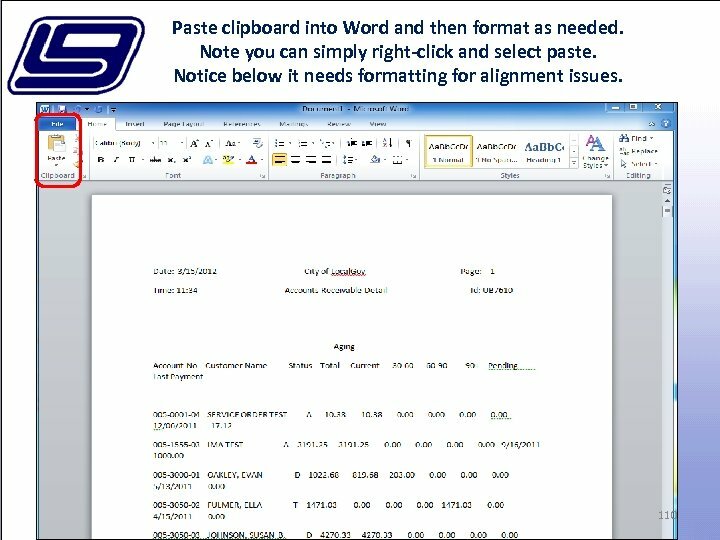 Status to Print = A I requested to generate labels and to include the account # on the label. 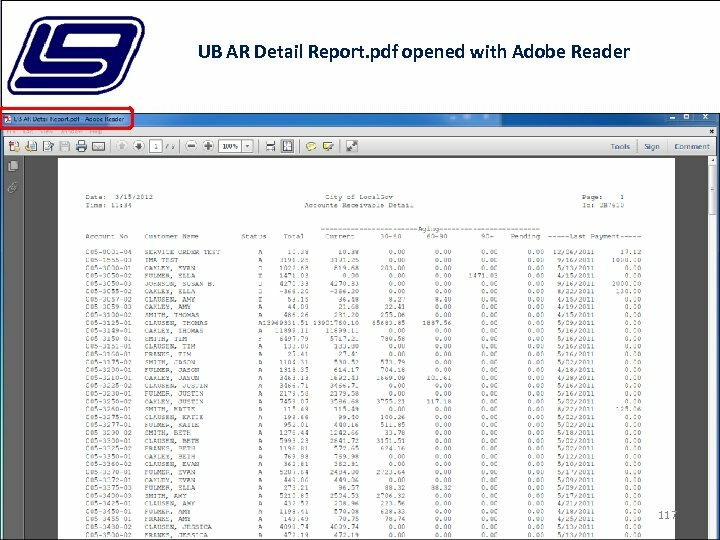 Note – the label file will be created in your spooler folder and will be named UB 1640 LB. You will need to print them from the spooler. Example of Label output shown below: Note this option produces 1 -up labels – size 1” x 3. 5” They are normally printed on a tractor feed type dot matrix printer. 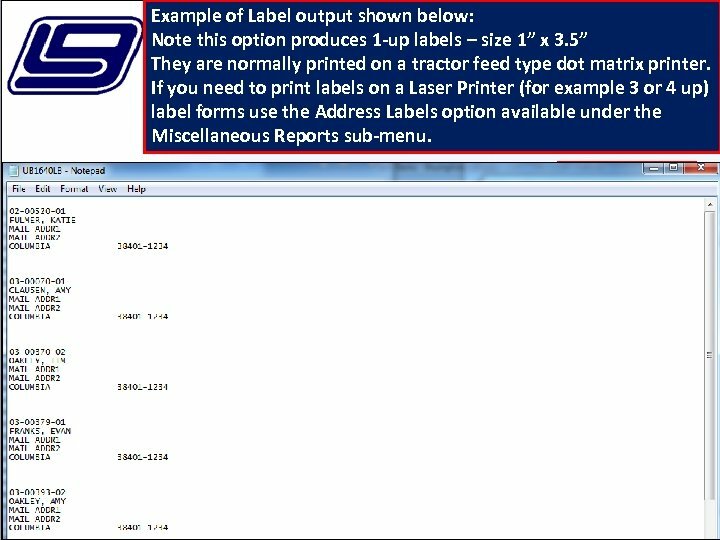 If you need to print labels on a Laser Printer (for example 3 or 4 up) label forms use the Address Labels option available under the Miscellaneous Reports sub-menu. 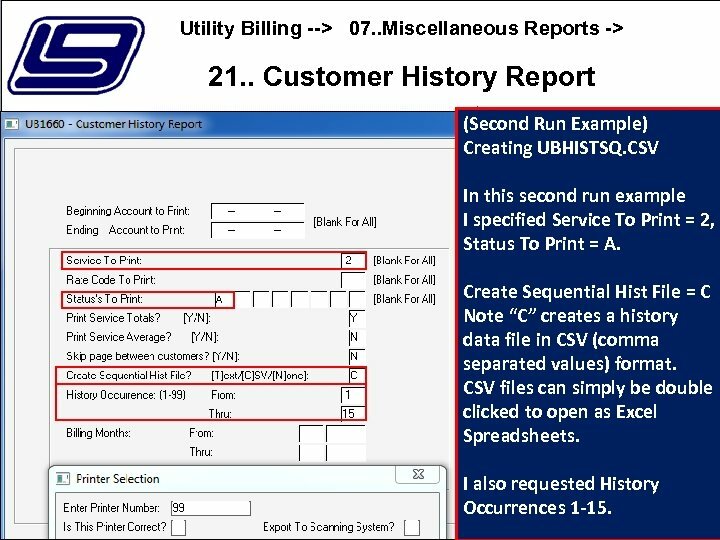 Utility Billing --> 07. . Miscellaneous Reports -> 21. . 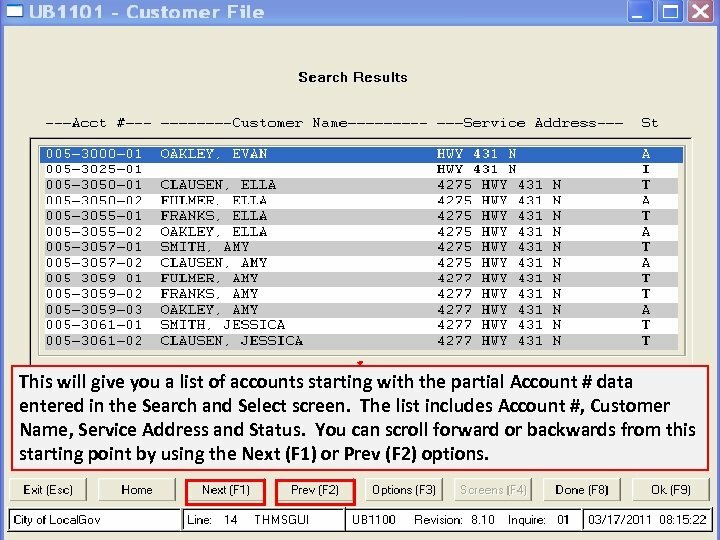 Customer History Report The Customer History Report allows you to filter by Account # range, Service, Rate Code and Status. You can also specify to include a range of History Occurrences and Billing Months. In the run example shown I changed two of the run defaults. I specified… Status to Print = A History Occurrence from 1 thru 15. 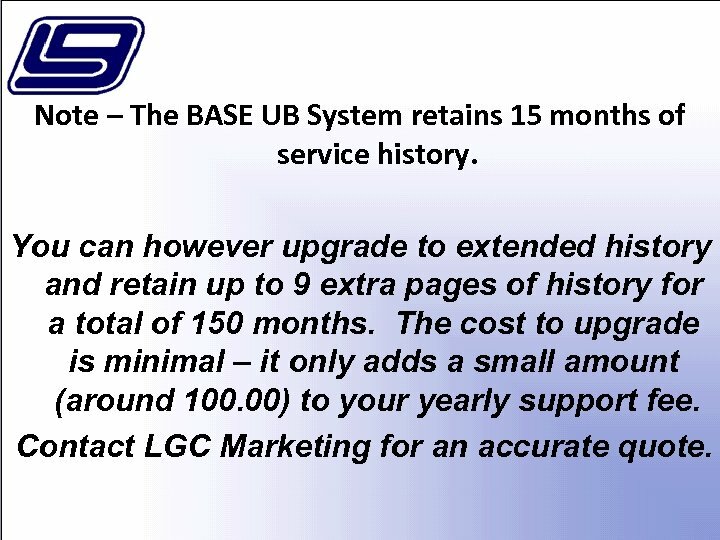 Note – The BASE UB System retains 15 months of service history. You can however upgrade to extended history and retain up to 9 extra pages of history for a total of 150 months. The cost to upgrade is minimal – it only adds a small amount (around 100. 00) to your yearly support fee. Contact LGC Marketing for an accurate quote. 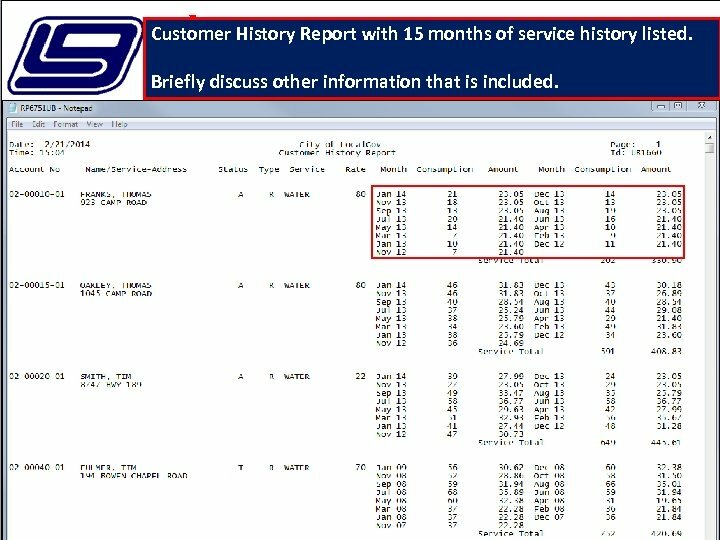 Customer History Report with 15 months of service history listed. Briefly discuss other information that is included. 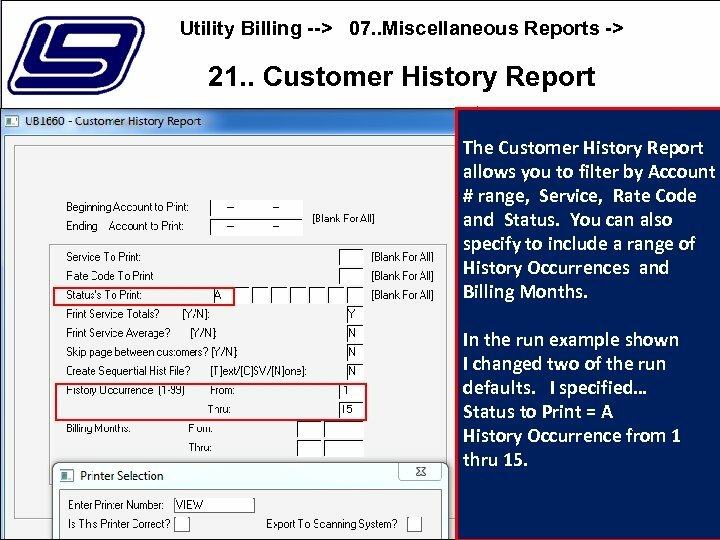 Utility Billing --> 07. . Miscellaneous Reports -> 21. . 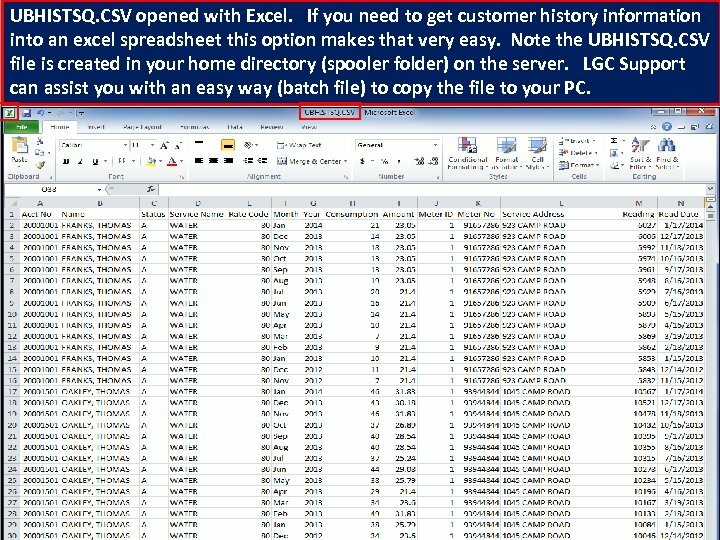 Customer History Report (Second Run Example) Creating UBHISTSQ. CSV In this second run example I specified Service To Print = 2, Status To Print = A. 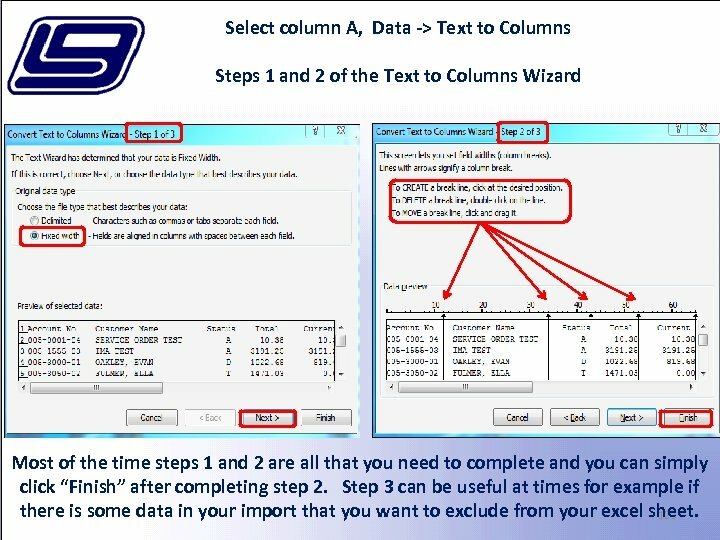 Create Sequential Hist File = C Note “C” creates a history data file in CSV (comma separated values) format. CSV files can simply be double clicked to open as Excel Spreadsheets. I also requested History Occurrences 1 -15. UBHISTSQ. CSV opened with Excel. If you need to get customer history information into an excel spreadsheet this option makes that very easy. Note the UBHISTSQ. 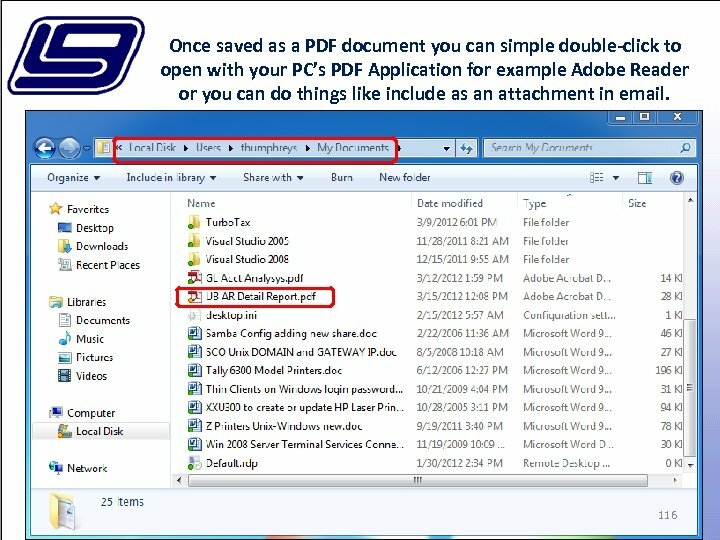 CSV file is created in your home directory (spooler folder) on the server. 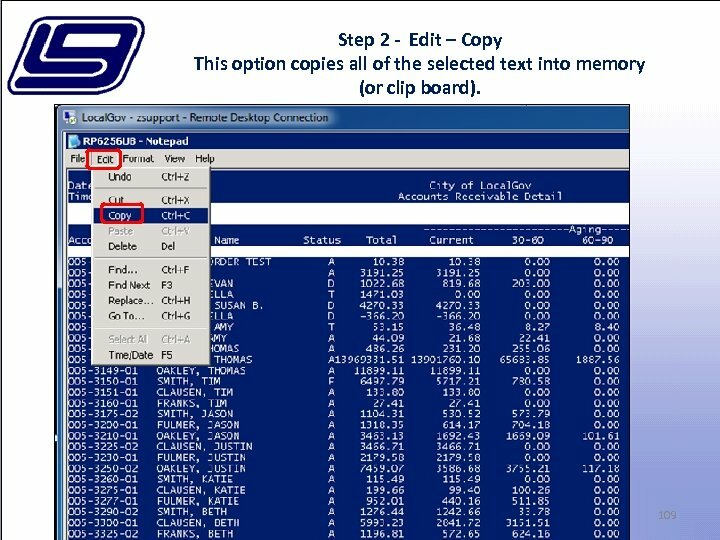 LGC Support can assist you with an easy way (batch file) to copy the file to your PC. Note – the Z Utility Billing system has many more report options available on the Miscellaneous Reports menu and on other sub-menus. The goal of this presentation is to simply show you a few examples of some frequently used reports. 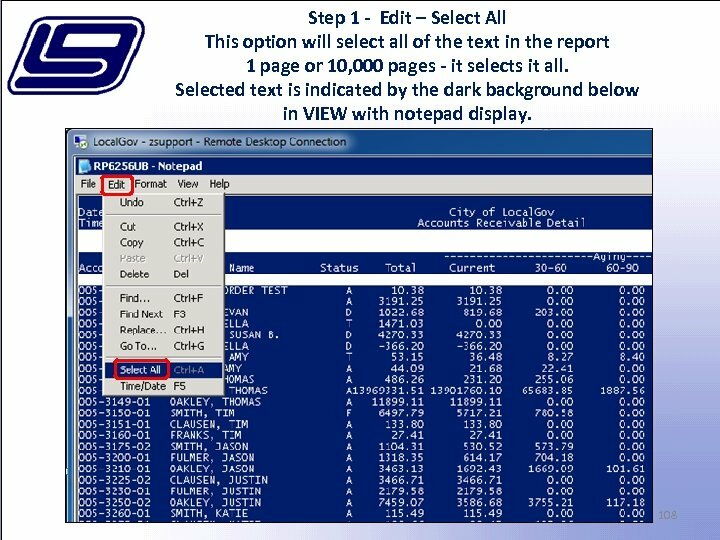 You should be able to apply what you learned today to generate other useful reports on the system. Note: Concepts, not yet approvedпрезентация для персонала. хостес.